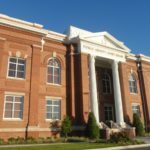 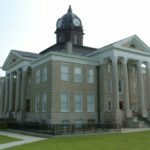 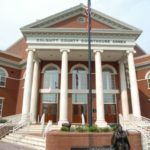 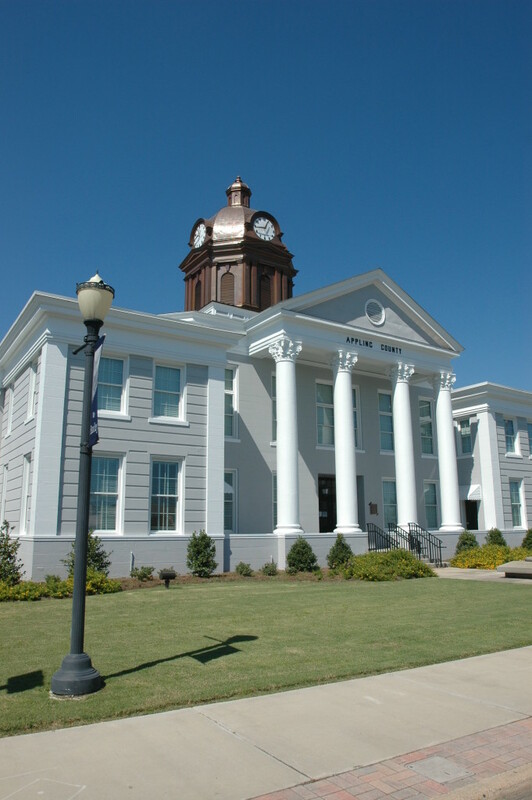 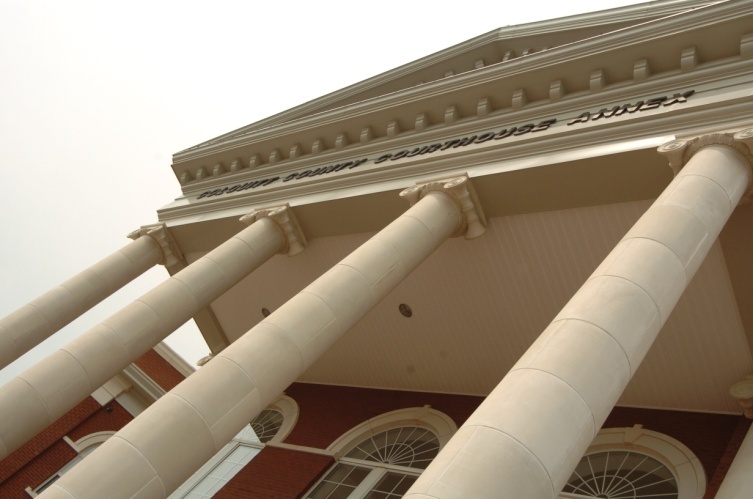 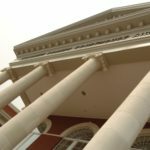 McCall & Associates, Inc. provided design and management services for the rehabilitation of the Appling County Courthouse. 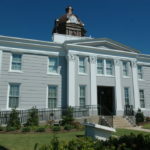 This neo-classical revival style building was originally built in 1908 and features pedimented Corinthian portico and pavilions, and an octagonal domed clock tower to ornament the building’s exterior, while the interior of the first floor features Georgia marble wainscoting. 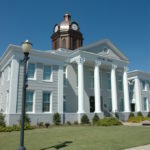 The courthouse is listed on National Register of Historic Places. 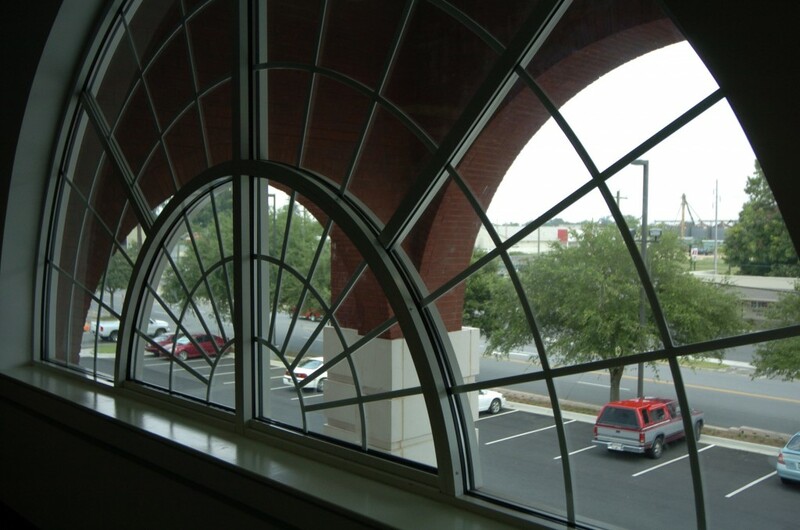 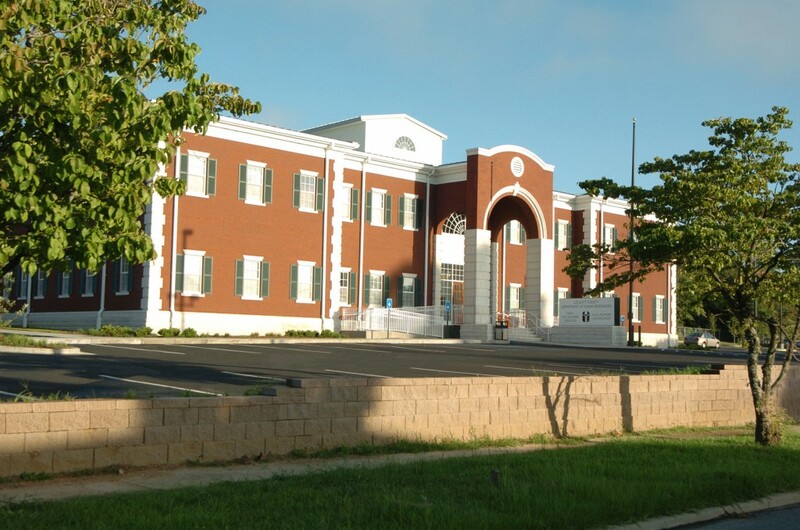 This project was phased and included the construction of a new courthouse annex as well. 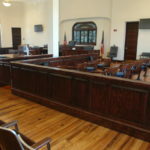 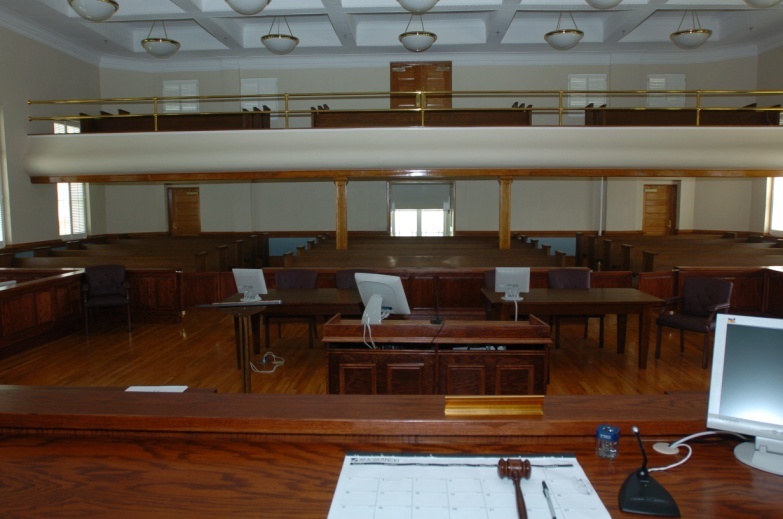 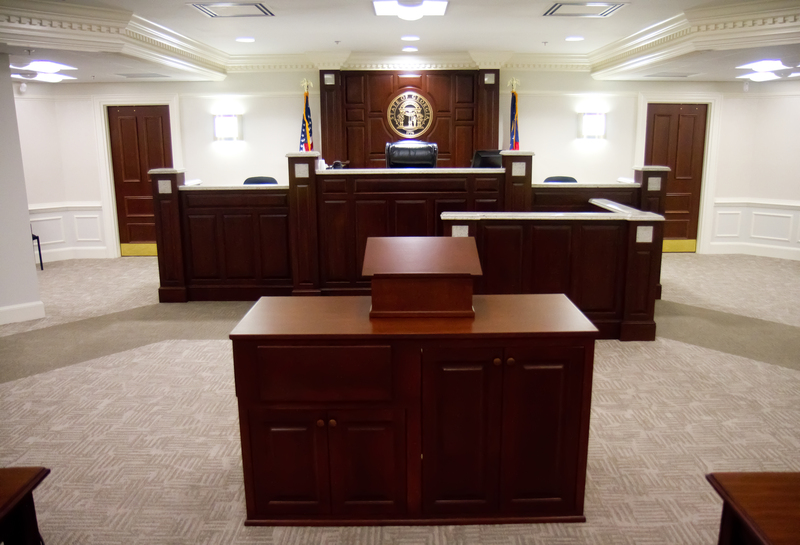 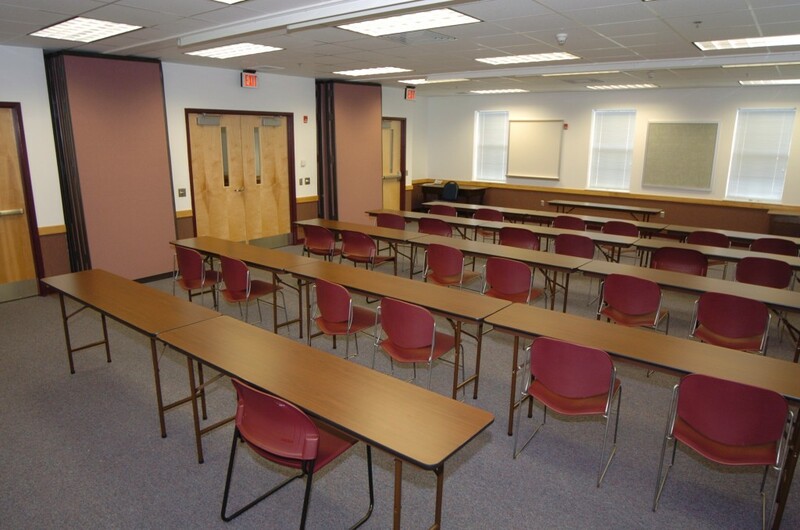 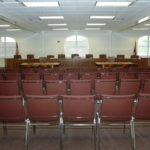 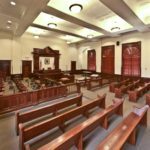 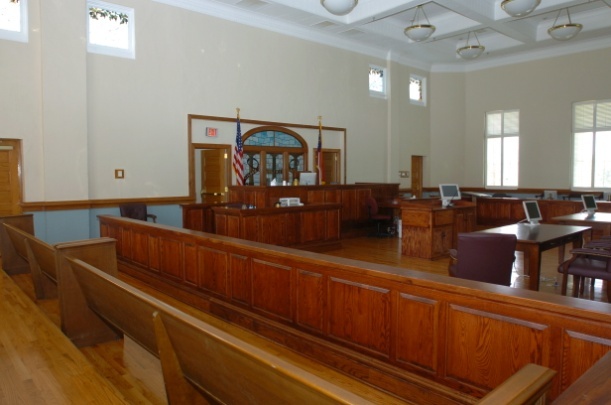 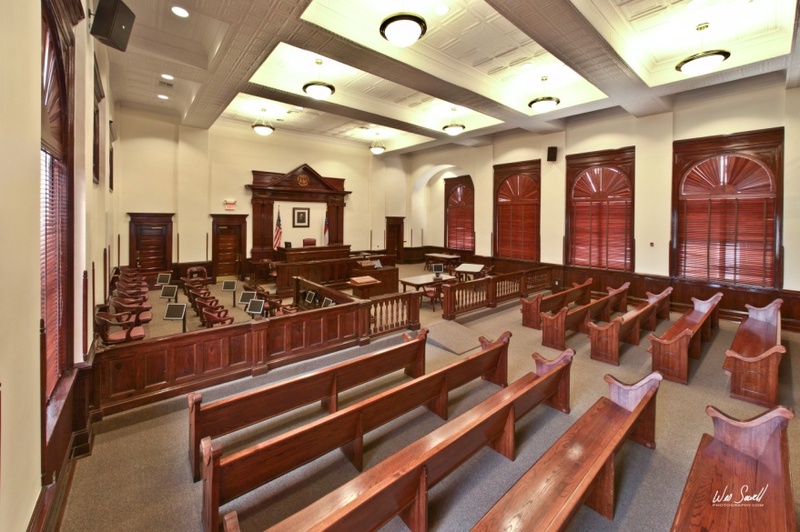 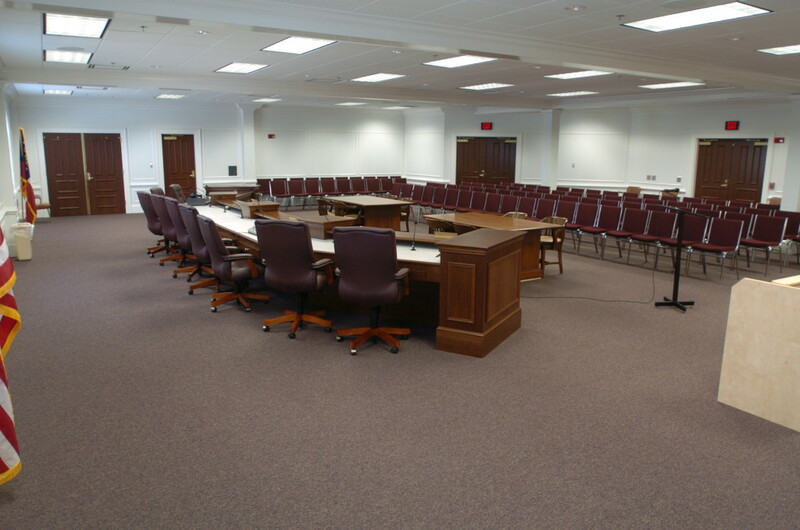 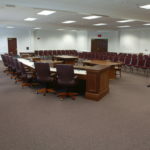 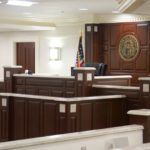 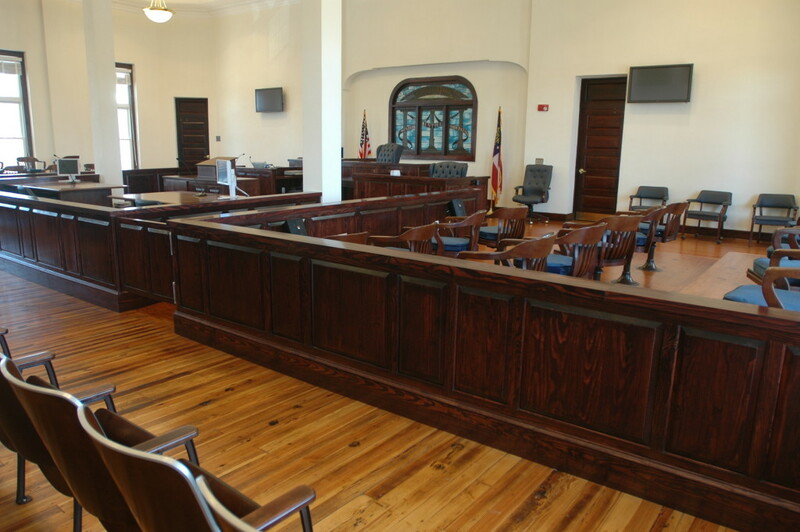 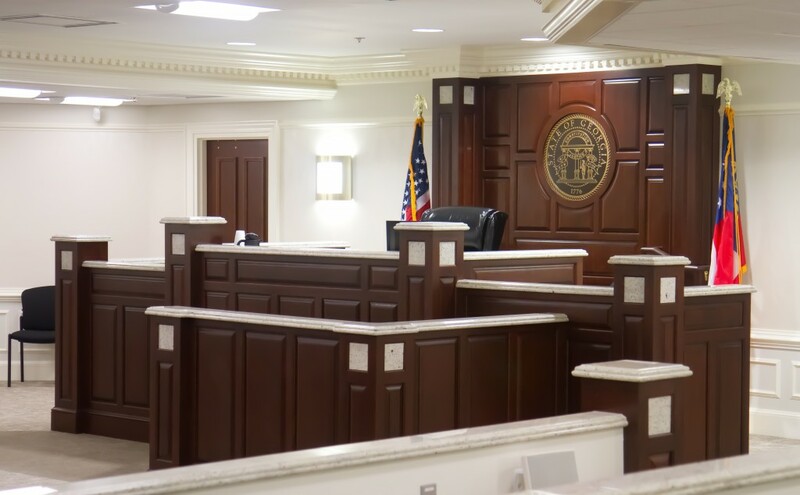 All building systems were upgraded to fit today’s modern working environment, and the courtroom now utilizes a state-of-the-art evidence presentation system. 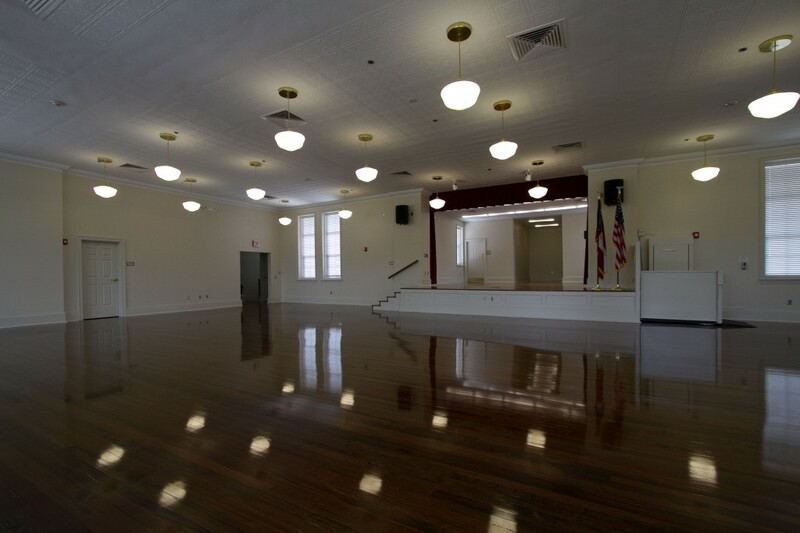 Historic architectural elements and materials, such as Georgia marble wainscoting, heart pine flooring, and a stamped decorative metal ceiling and metal cornice were preserved as much as possible. 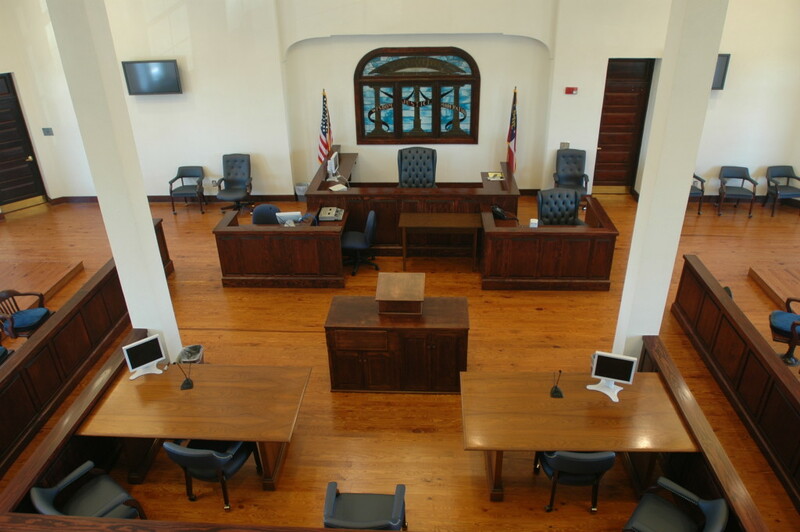 The courtroom features a unique stained glass installation depicting the Georgia state seal, which was included in the original building, and this artistic element was also preserved and reused in the updated courtroom. 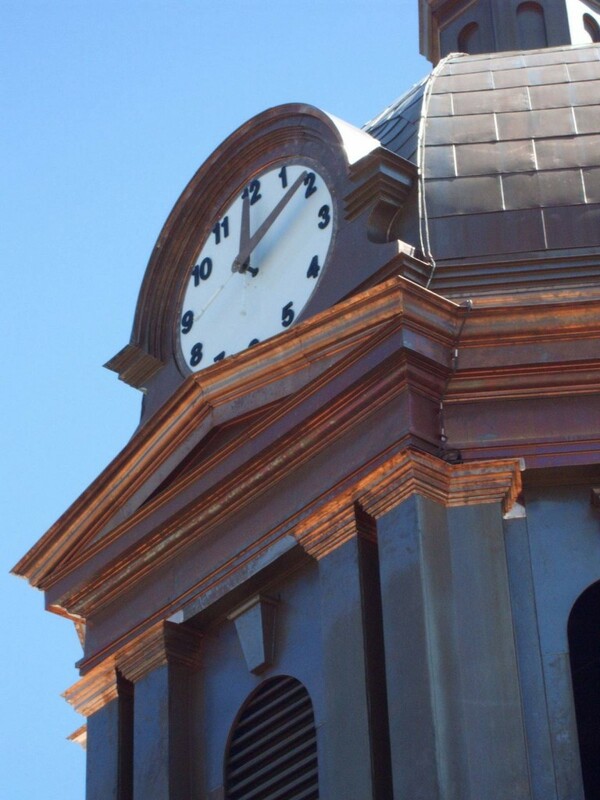 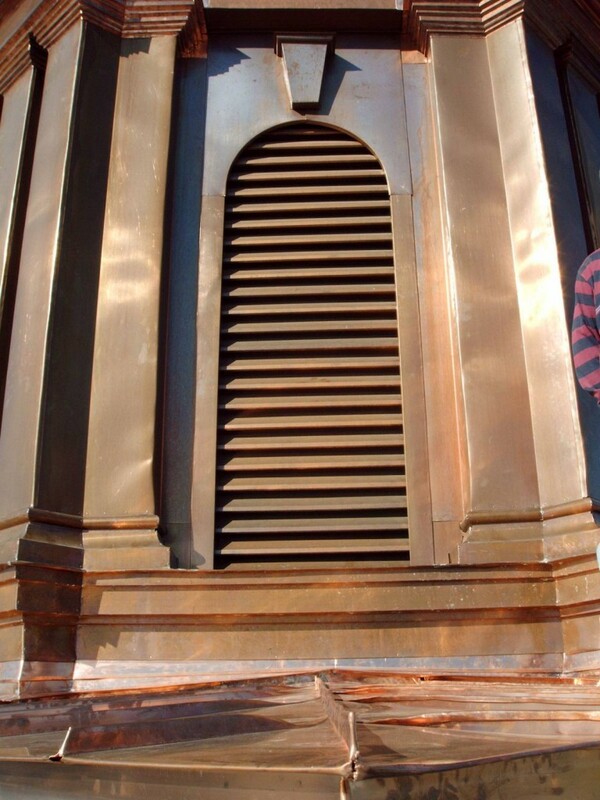 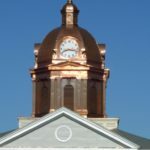 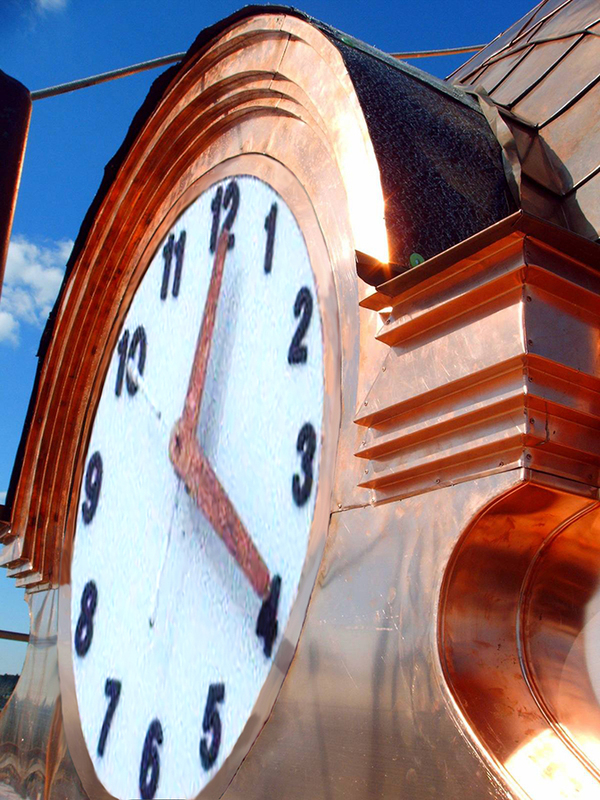 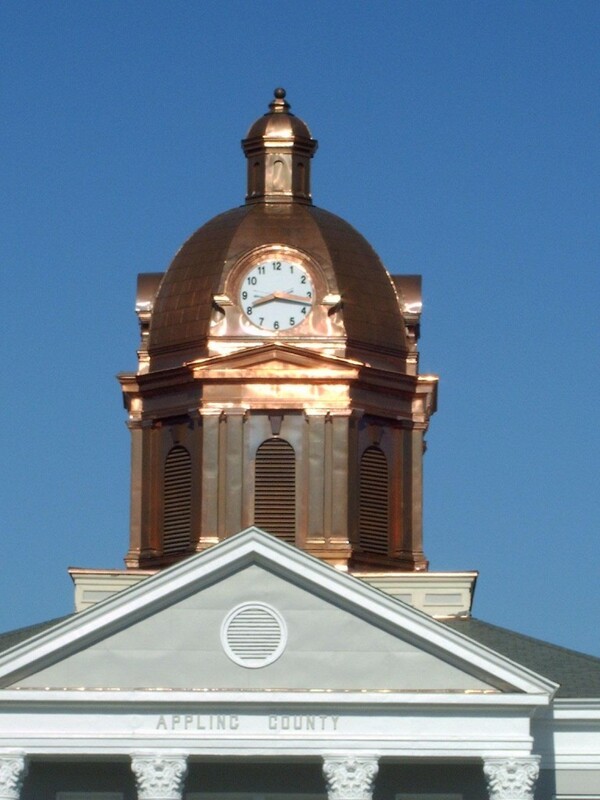 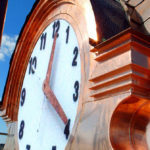 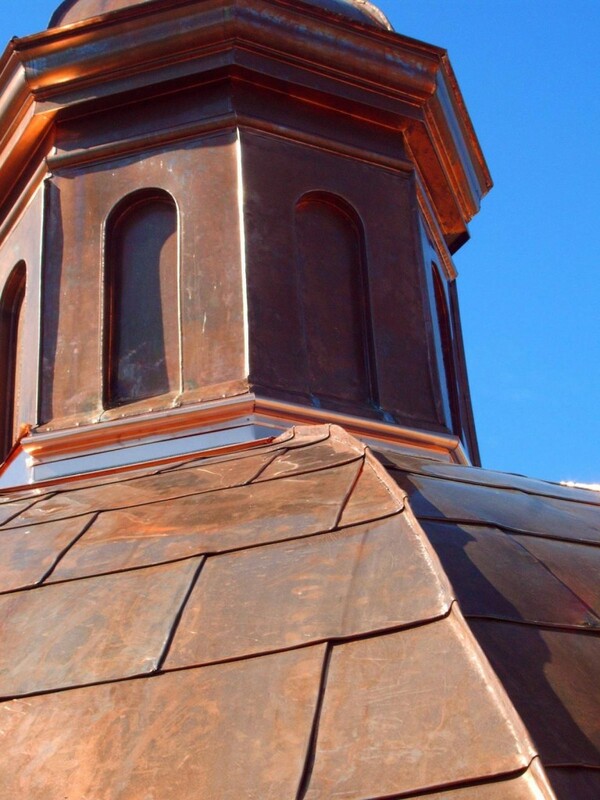 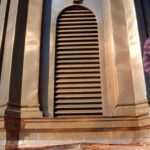 The entire courthouse was re-roofed including a membrane roof on flat roof areas, a slate shingle roof on sloped roof areas, and at the very top, sits the re-worked and restored, copper-clad bell/clock tower with a beautiful copper-covered dome roof. 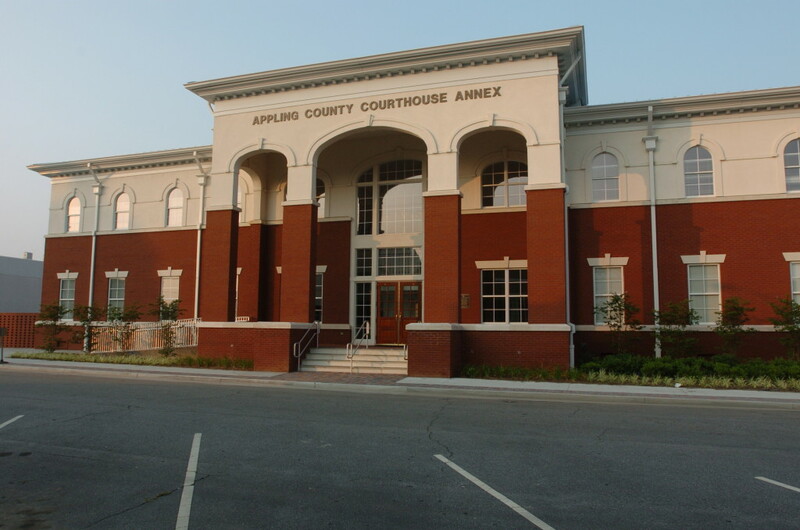 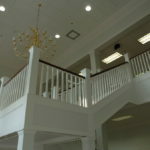 McCall and Associates provides architectural and engineering services, project management services and managing architect services on a phased building project for Appling County Board of Commissioners, which included the design and construction of a new county courthouse annex office building, followed by the renovation of the historic Appling County Courthouse. 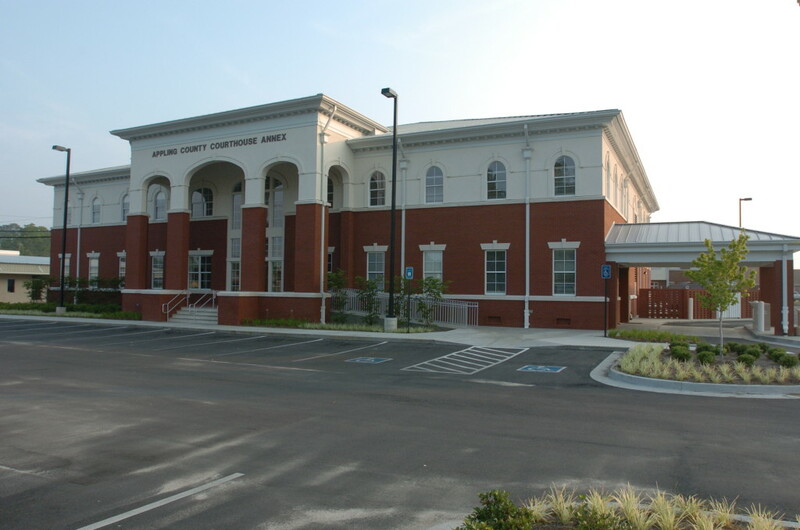 The annex houses all county administrative functions, as well as overflow courtroom space. 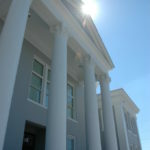 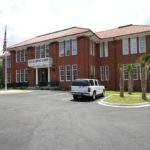 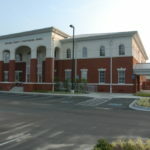 The new building was sited in such a way so that it would be close to the courthouse for efficient day-to-day operations. 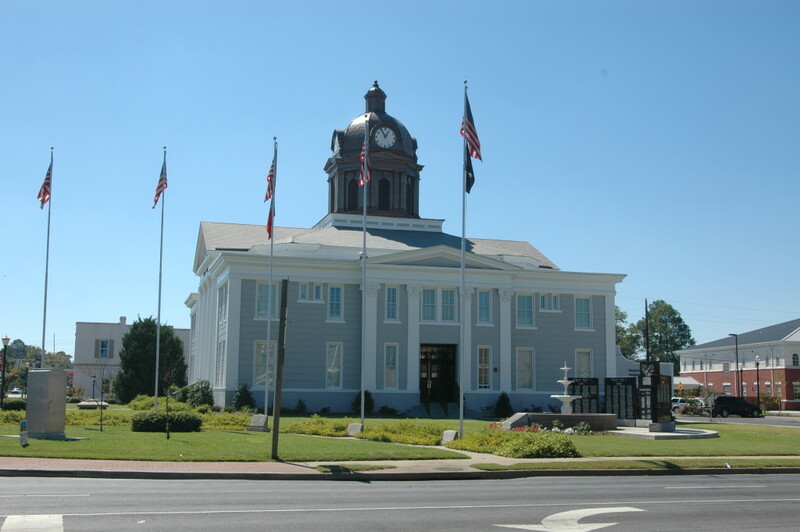 The building was designed to fit into the historic character of the downtown district without overshadowing the historic courthouse which is the centerpiece of the town. 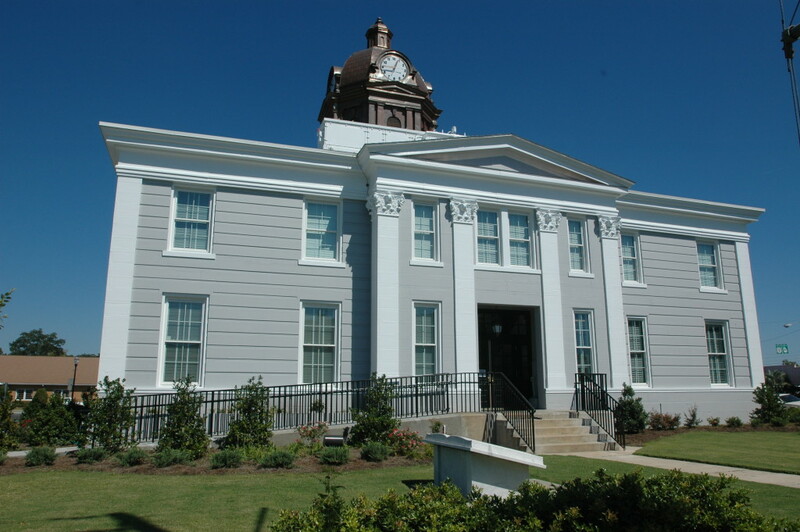 McCall Architecture worked with the City of Blackshear, Georgia, to conduct an extensive analysis and study of the area’s historic hanging jail. 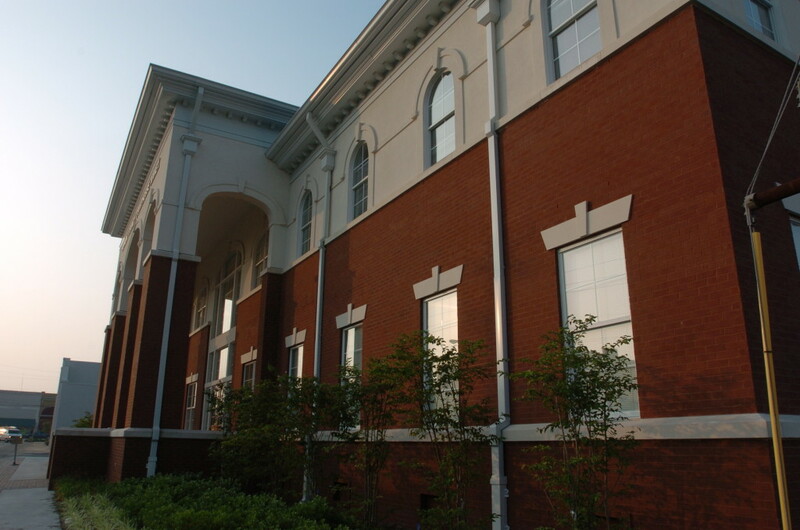 This two-story brick structure was completed between 1899 and 1903. 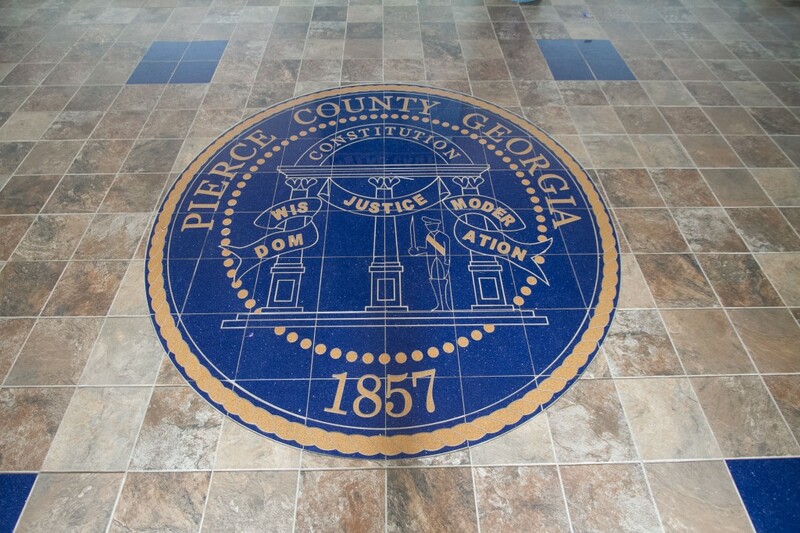 The facility was used as the county jail until the 1920s and was the third of Pierce County’s five jails. 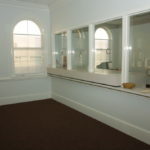 In addition, it was used as the City Jail for approximately fifty years. 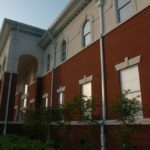 The original significance of the Jail lies in its architectural styling, but now the building is also of historic significance to both the state and the region. 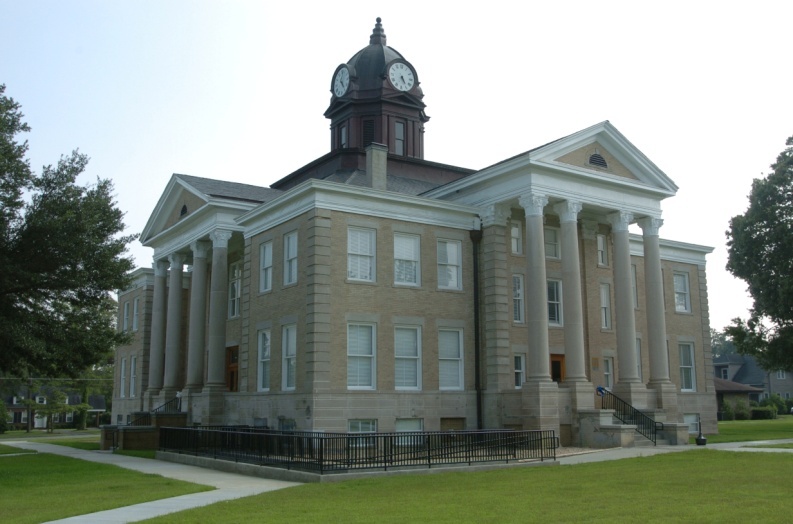 State law in Georgia at the time of the Jail’s construction prohibited public hangings thereby requiring internal gallows. 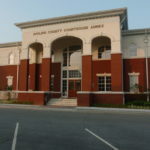 The Jail is one of only two “hanging jails” which remain in Georgia. 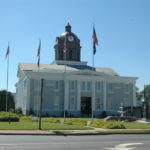 The gothic architecture of the building was unique to South Georgia, with a tower centered on the main façade and ornamental brickwork. 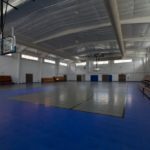 In addition, the predominant material choices (concrete, brick, and steel) and minimal use of wood made the facility virtually fireproof. 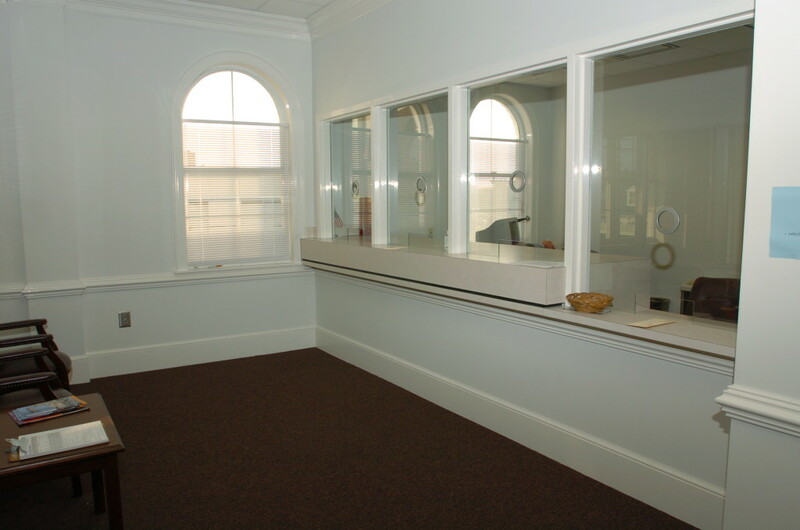 This was a substantial upgrade from the prior jail facilities which were primarily made of wood. 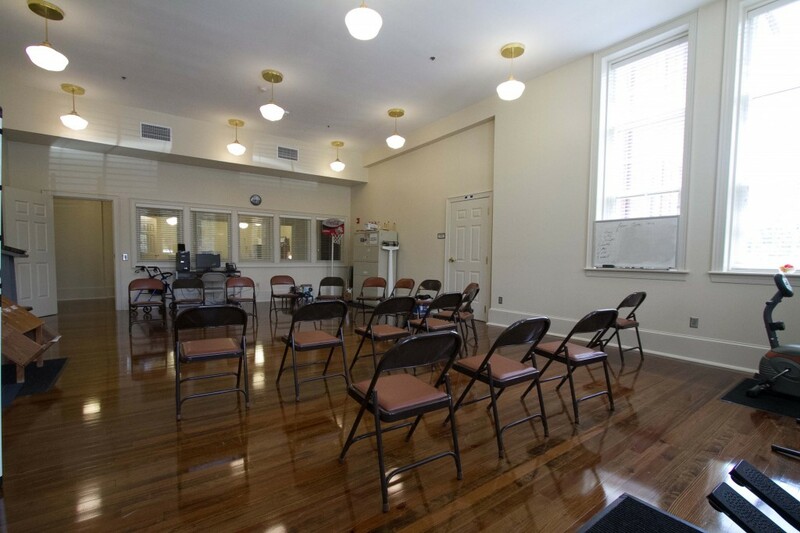 The full documentation of the facility will aid in the rehabilitation of the Jail for its eventual adaptive reuse. 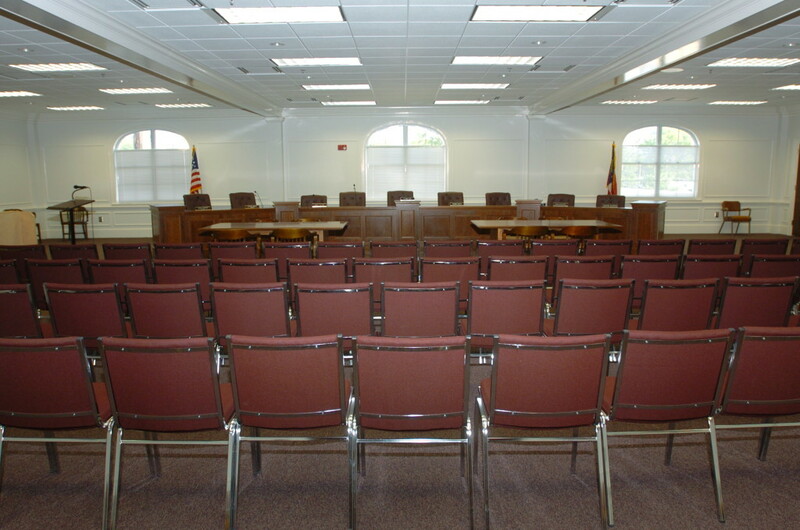 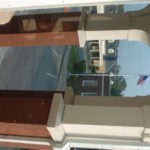 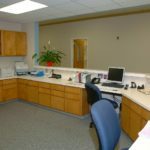 The City of Blackshear plans to rehabilitate the currently unused space for administrative spaces for city functions. 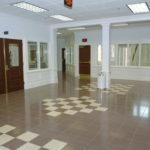 The close proximity to City Hall makes it an ideal location for such use. 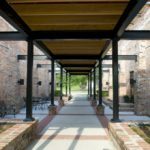 Incorporating original architectural elements, McCall Architecture took eyesores and created an attractive and functional solution to infrastructure issues. 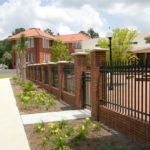 McCall Architecture aided the City of Boston, Georgia, in confronting with the dilemma that many small towns face – how do they embrace growth while maintaining the character of the town? 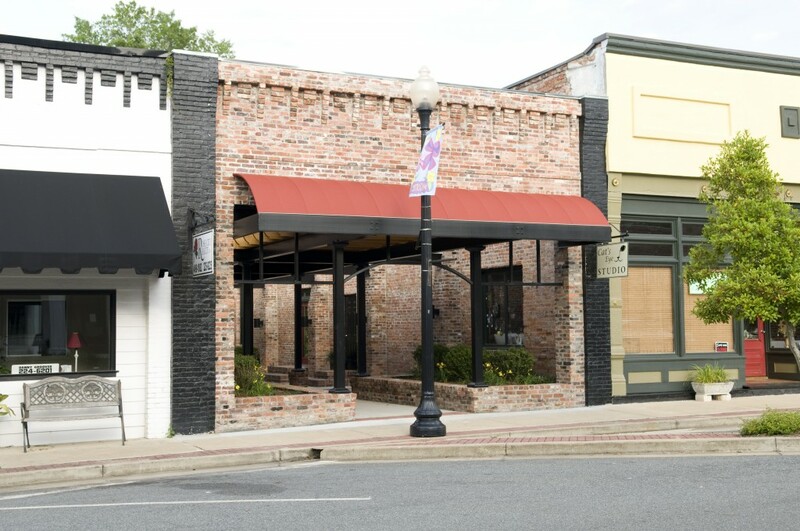 Boston, located Thomasville and Quitman, is experiencing a revitalization of its downtown area. 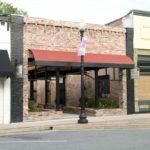 This revitalization precipitates the need for infrastructure (in this case, available parking) to support the growth of the center of commercial and civic activity. 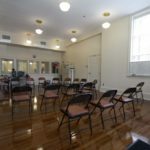 The City of Boston acquired three pieces of property in anticipation of this project: the condemned storefront space, a parcel of undeveloped property that runs behind the row of buildings, and a portion of a parcel next door to the condemned storefront. 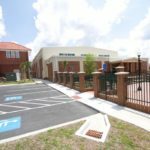 The initial project created a feasibility report on an additional parking lot and associated enhanced greenspace in the downtown area. 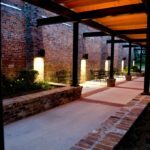 The subsequent project converted the ruins of one of the town’s original storefronts into a pedestrian walkway to a new parking area located directly behind the row of storefronts on Boston’s Main Street. 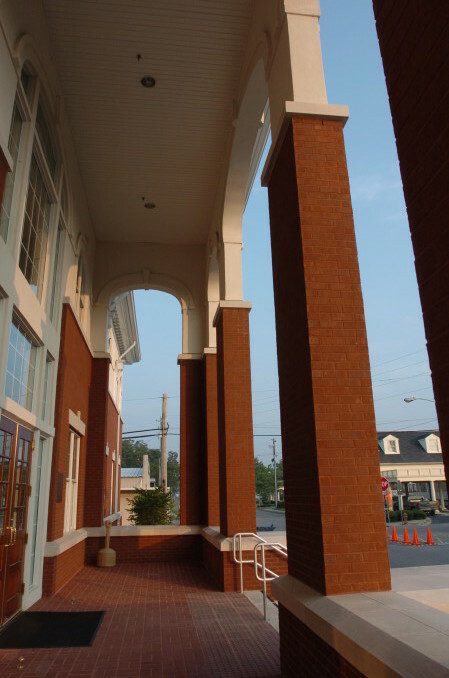 By utilizing the remaining aspects of the façade, the town’s historical character can be maintained, while making the space useful once more. 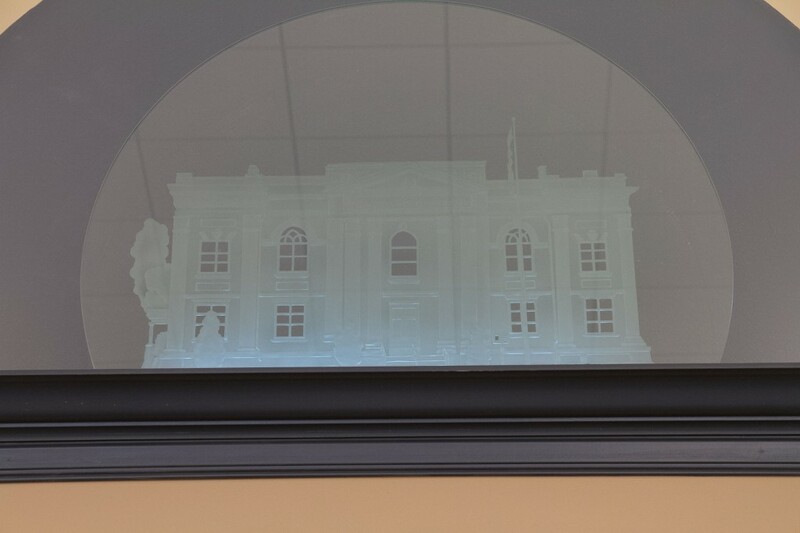 The improvements serve not only the needs of the citizens of Boston, but it will also increase access to downtown’s growing business community. 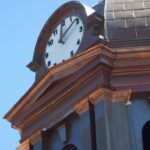 By adding more parking spaces, the town can now handle increased traffic to its downtown merchants and offices. 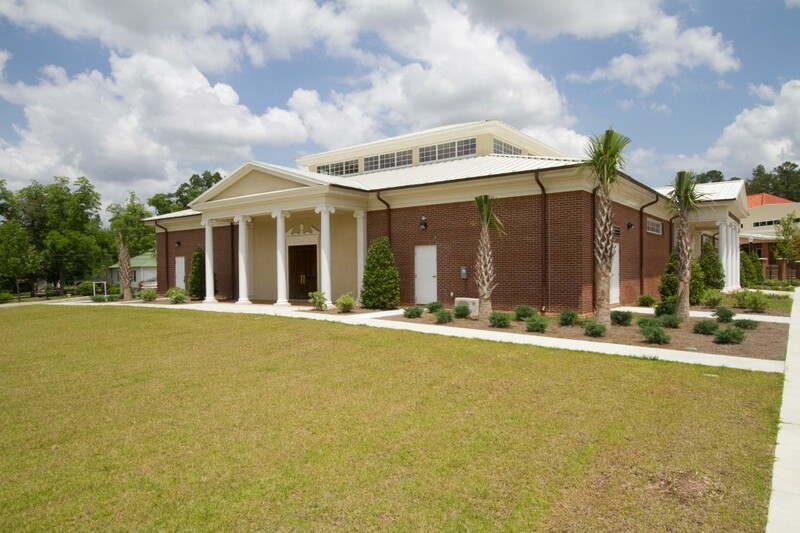 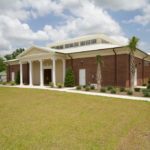 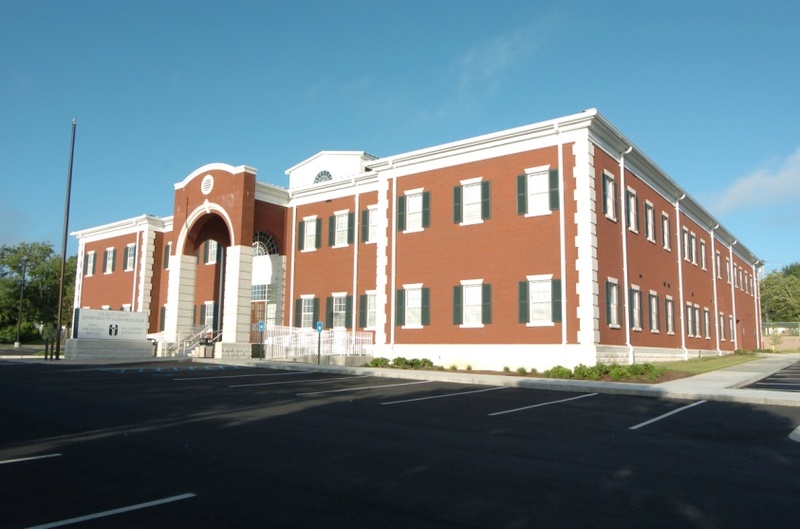 McCall & Associates, Inc. provided design and administration services for the construction of the new courthouse annex in Moultrie. 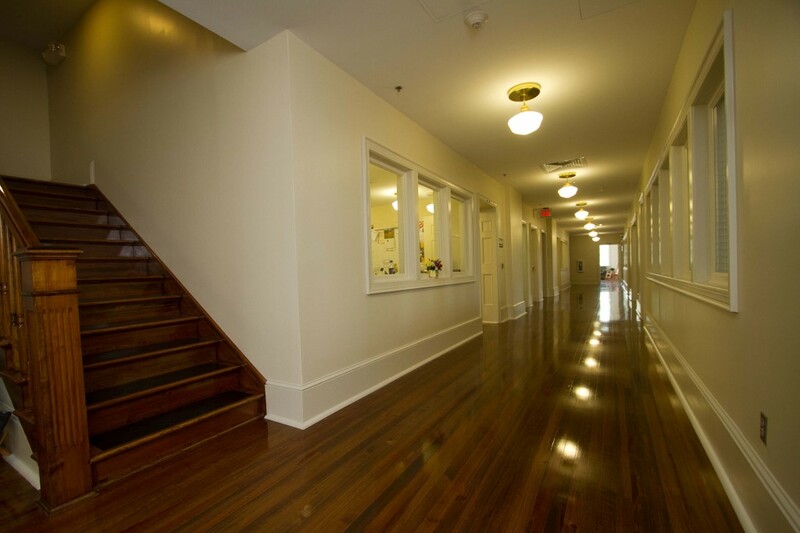 The traditional style of this new facility incorporates well into the historic character and charm of the downtown district. 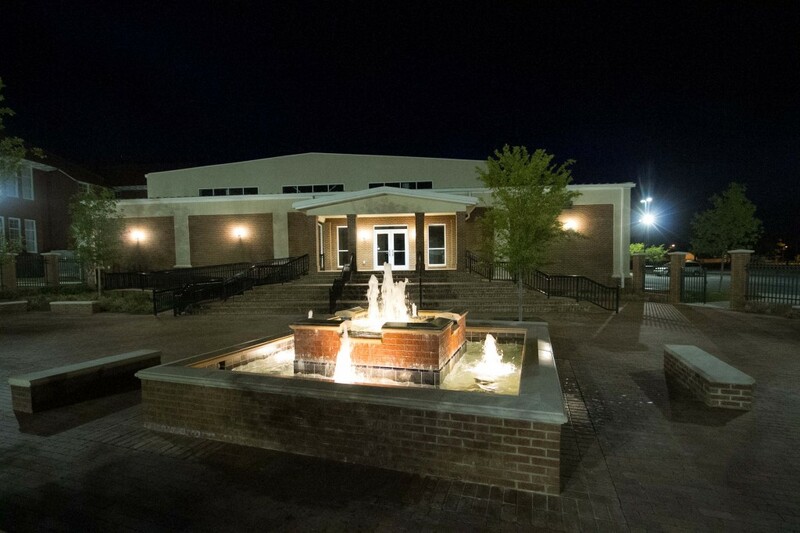 A bronze sculpture honoring veterans was placed on a park bench in front of the new annex. 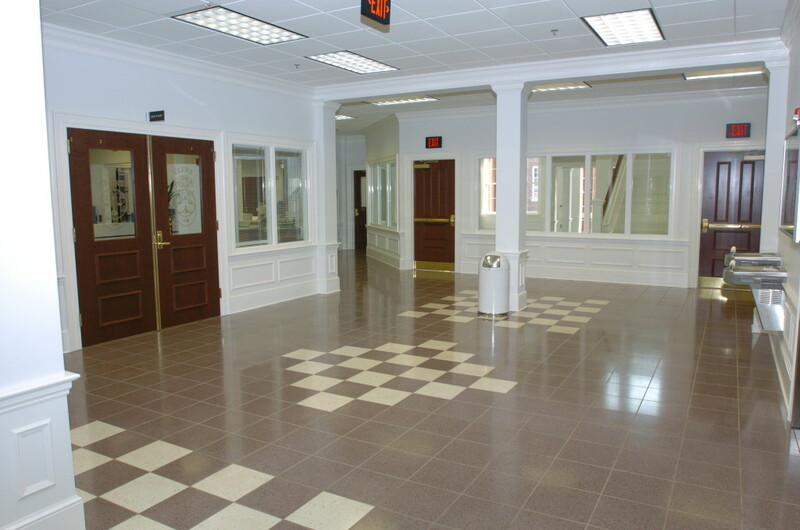 This three-story facility features flexible meeting/courtroom space, county administrative offices, and a tax/tag office with payment window. 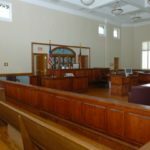 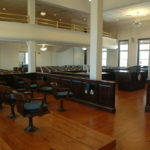 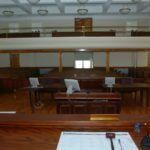 The historic courthouse is still used for court functions; however offices that moved out for its renovation found they still needed more space. 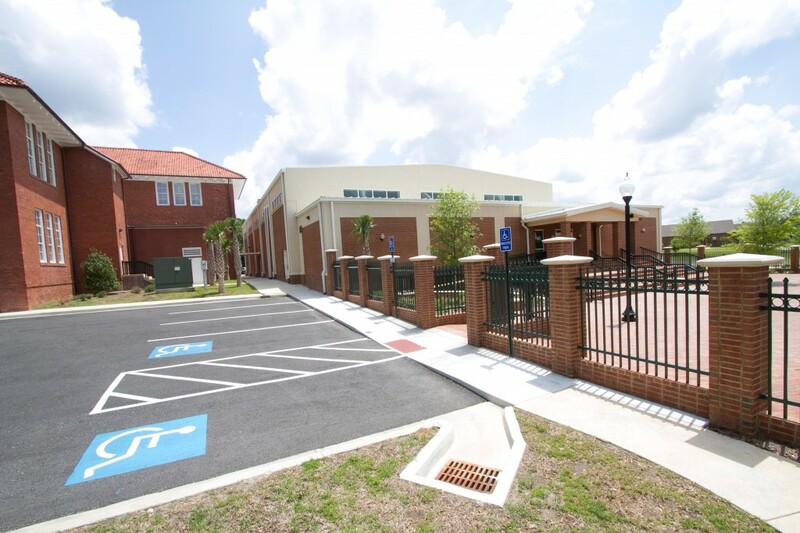 The annex has been embraced by the entire community and continues to meet the needs of this growing county. 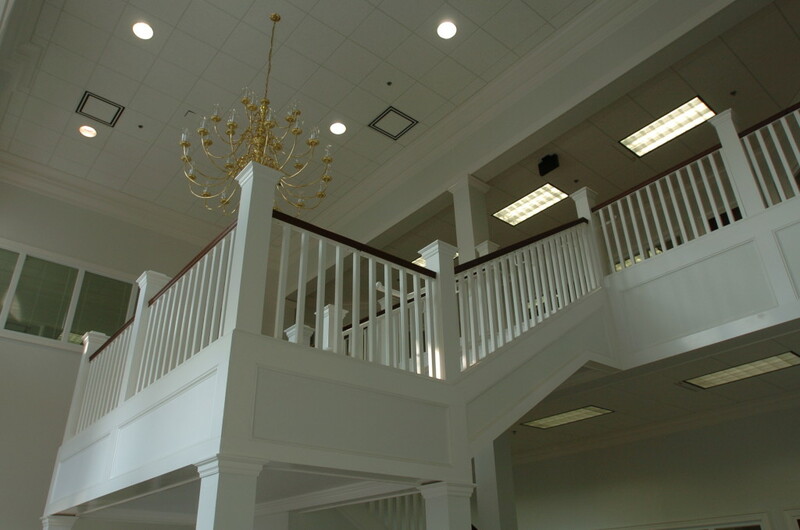 The initial construction project left a third floor unfinished for future growth. 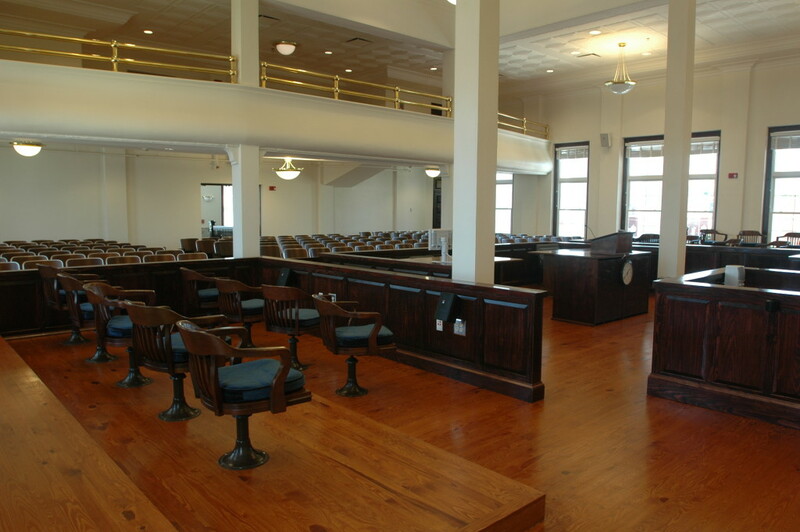 McCall & Associates, Inc. is now working on the build-out of this unfinished space into additional courtroom facilities. 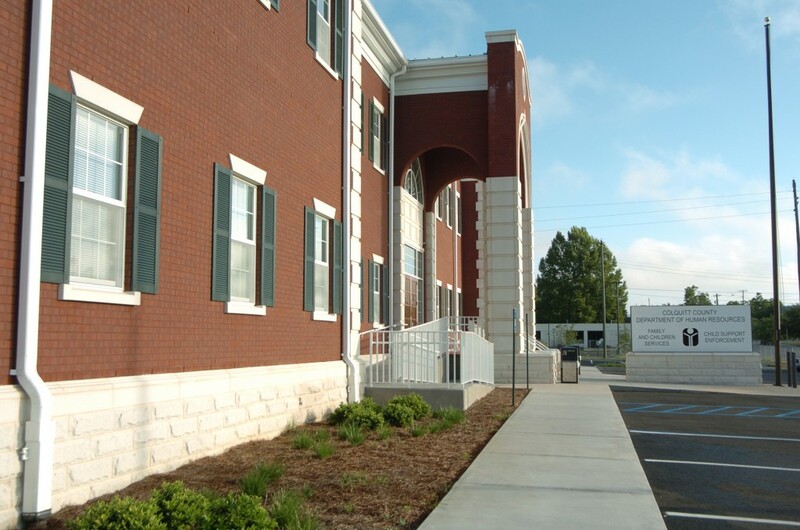 McCall & Associates, Inc. is provided architectural and project management services for the construction of the new Department of Family and Children Services and Child Support Enforcement facility. 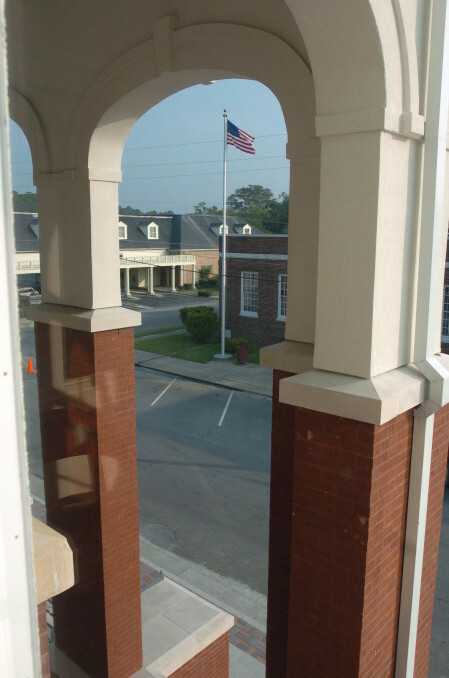 The traditional design blends well with the historic Moultrie area. 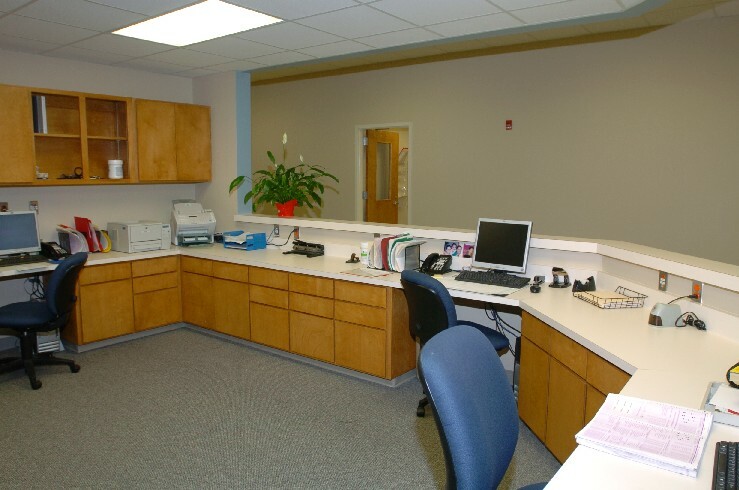 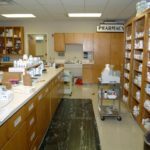 The approximately 40,000 sf building includes 69 fully outfitted furniture workstations, multi-purpose and divisible meeting space and protected client record storage. 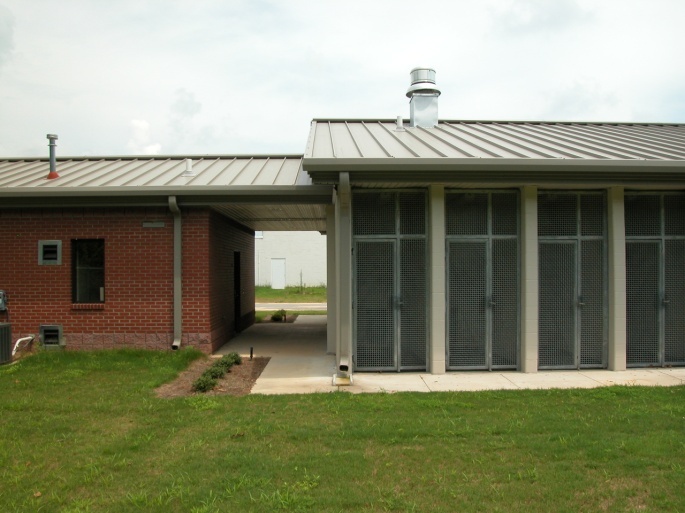 McCall & Associates, Inc. provided design and construction administration services for this new animal control building as part of a larger project which included the construction of a new Heard County Jail. 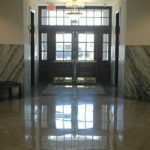 The 2,725 building features a lobby and administrative suite connected to the rear portion of the building by a covered breezeway. 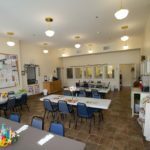 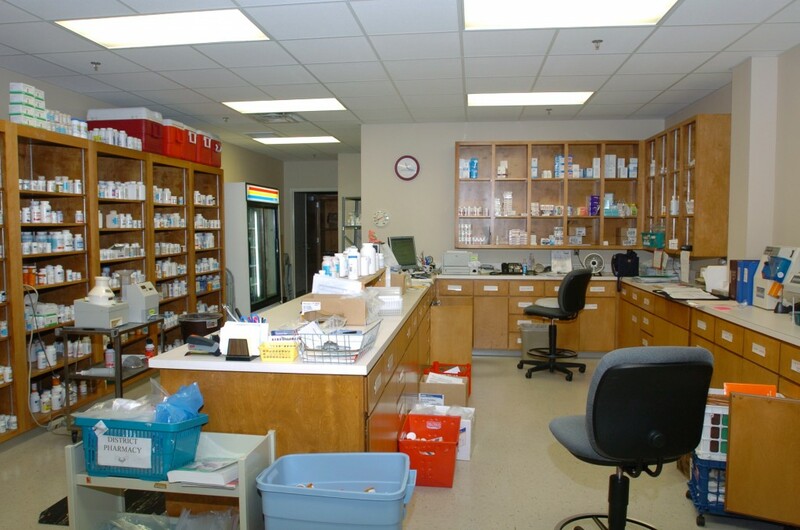 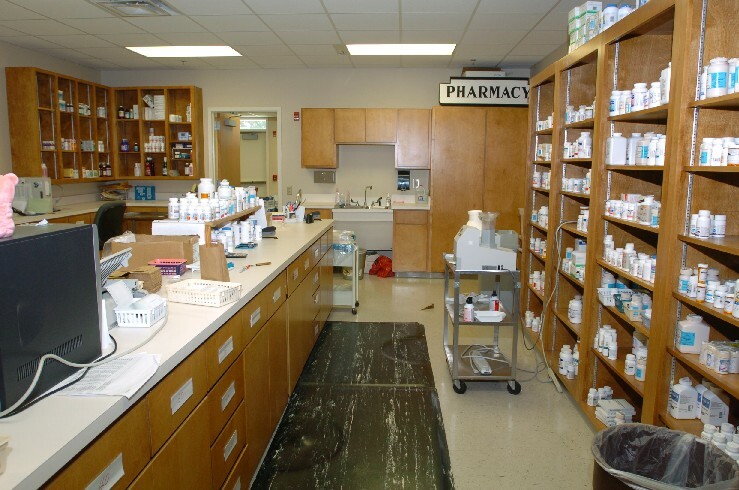 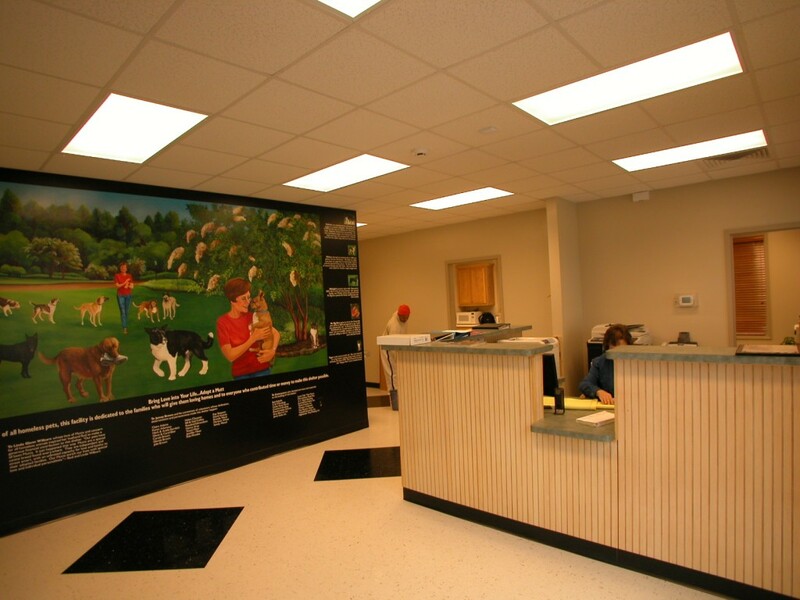 The rear of the animal control center includes an exam room, cat room, euthanasia room, storage room, indoor and outdoor kennels, and vehicle bay. 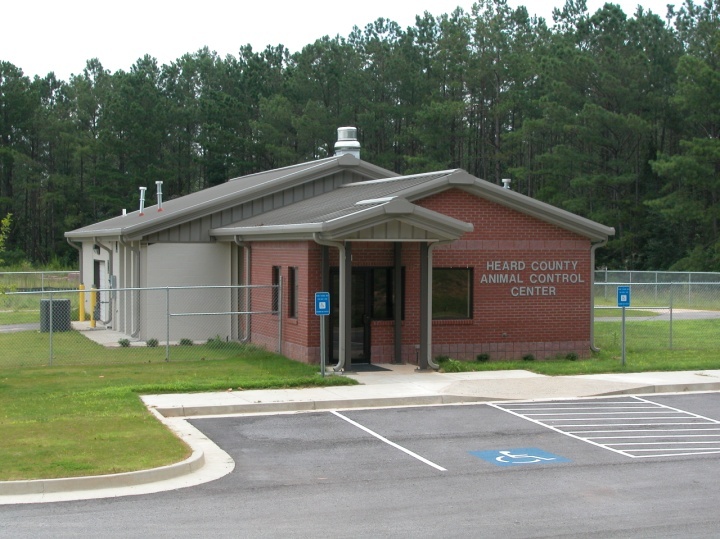 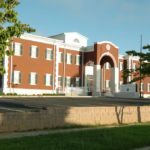 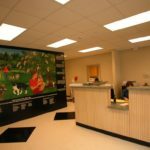 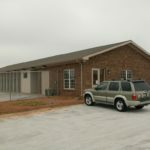 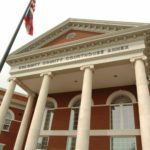 The Heard County Jail and Animal Control Center project was completed with change orders of less than one-tenth of one percent. 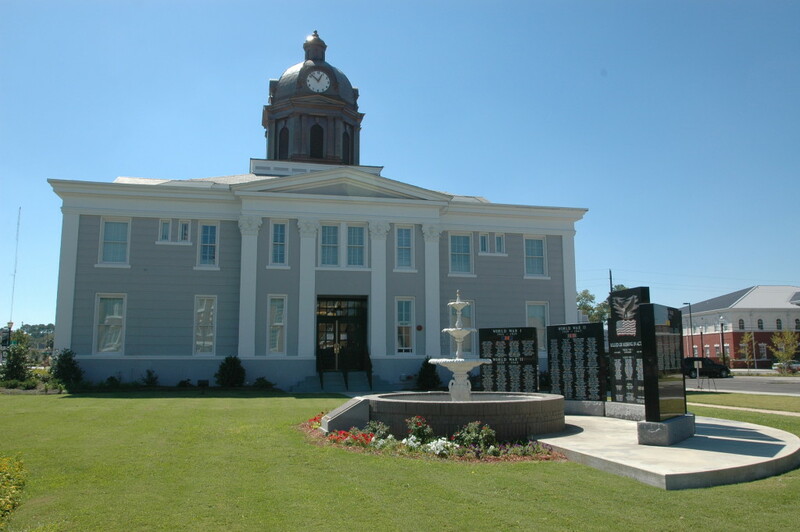 McCall Architecture worked with the Irwin County Board of Commissioners to accomplish the rehabilitation of the historic Irwin County Courthouse. 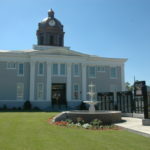 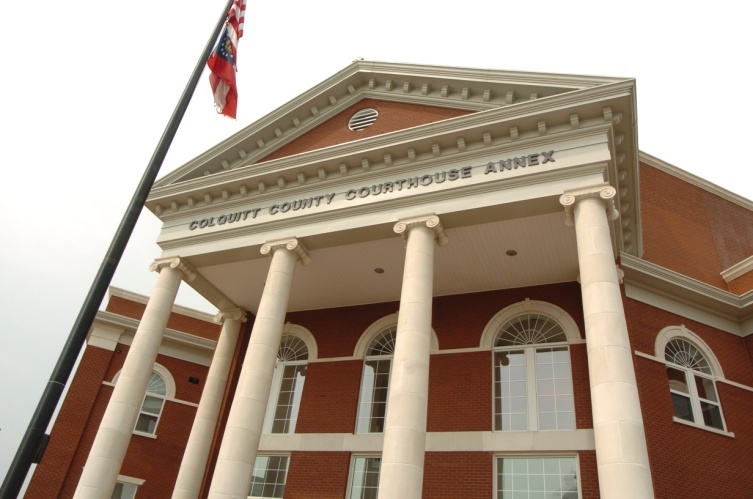 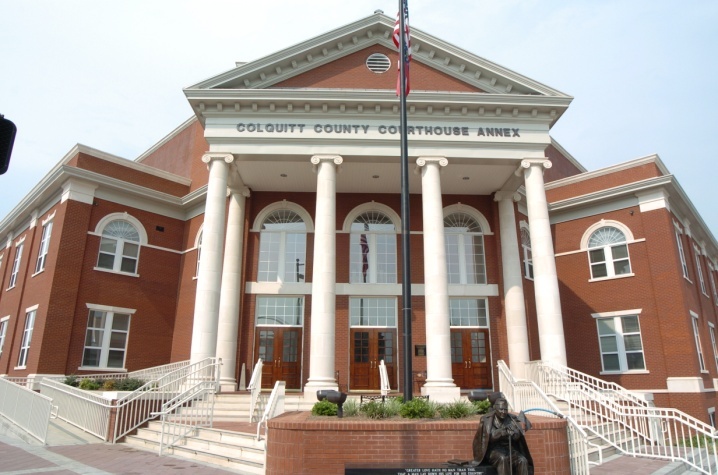 Located two blocks from the main downtown intersection, the courthouse is the county’s most recognizable landmark and the center of its governmental affairs. 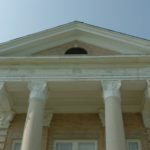 The structure was originally built in 1910 and is listed on the National Historic Register. 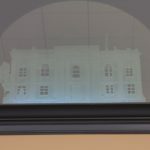 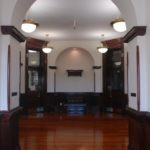 In addition to the toll that the years will take on an historic structure, the building had been subject to several interior renovations. 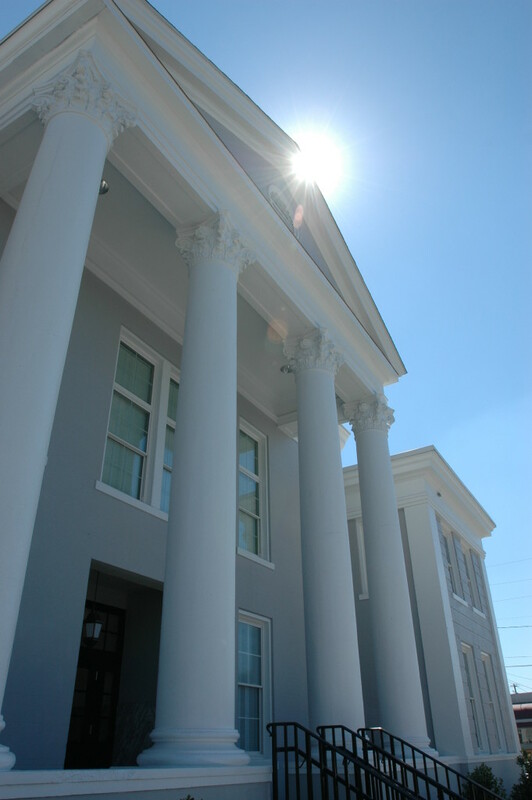 Our challenge was to restore the courthouse’s original architectural splendor while making it functional for today’s working environment. 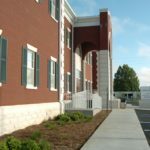 The scope included a complete removal of the previous renovations, the retrofit and upgrade of all systems and the addition of an elevator to this historic three-story facility. 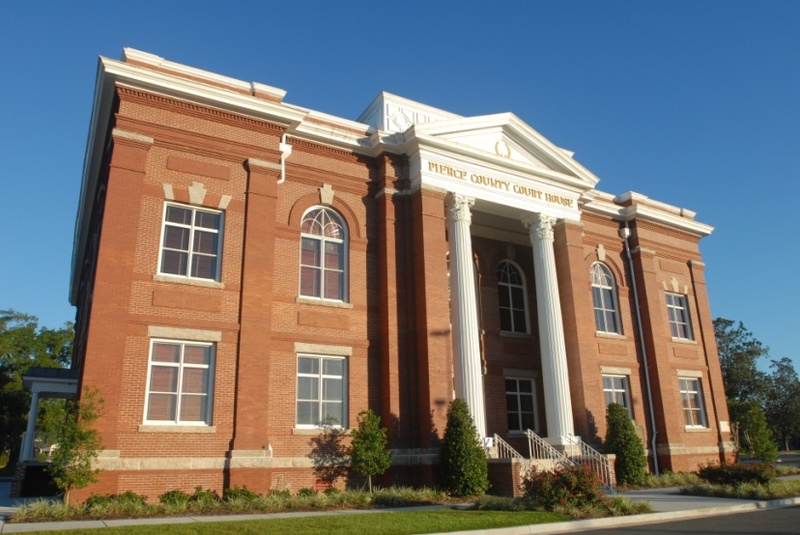 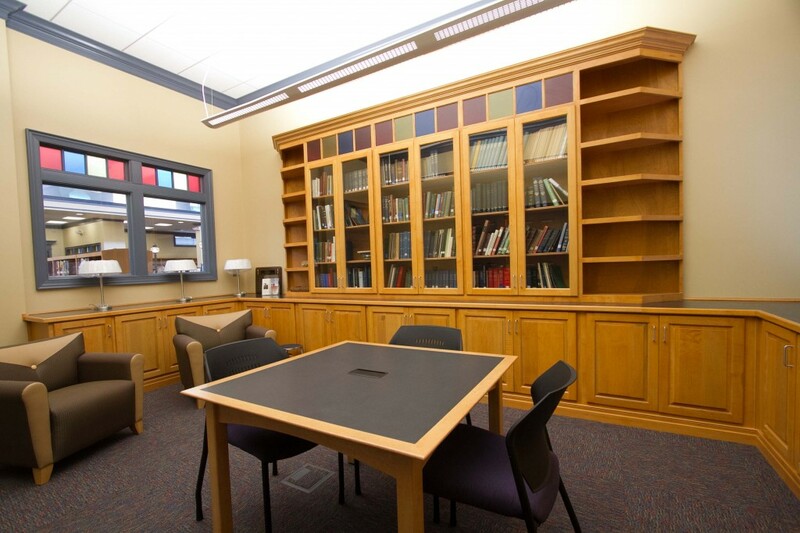 The newly renovated structure includes two original vaults, sheriff’s offices, district attorneys’ offices, clerk’s offices, probate and superior court functions. 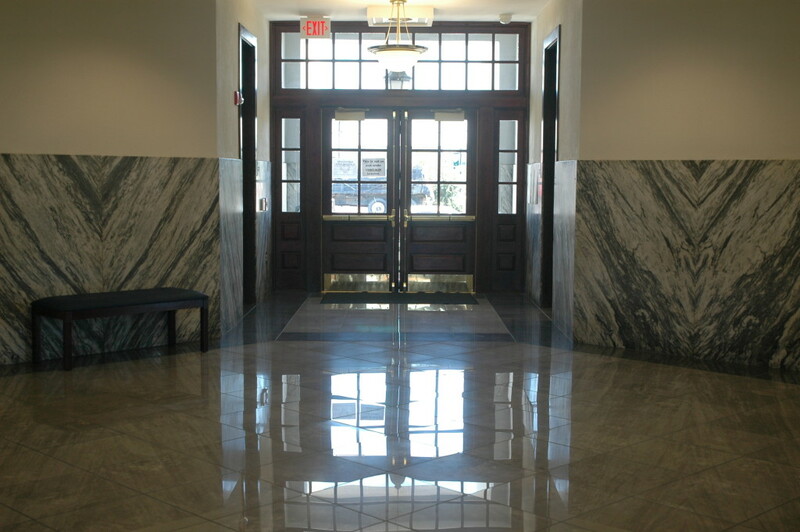 The building’s original finishes, including Georgia marble wainscoting, were preserved and reused as much as was possible. 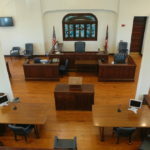 The courtroom, which makes up the majority of the building’s third floor, features a stained glass rendering of the seal of the State of Georgia which was preserved during the restoration. 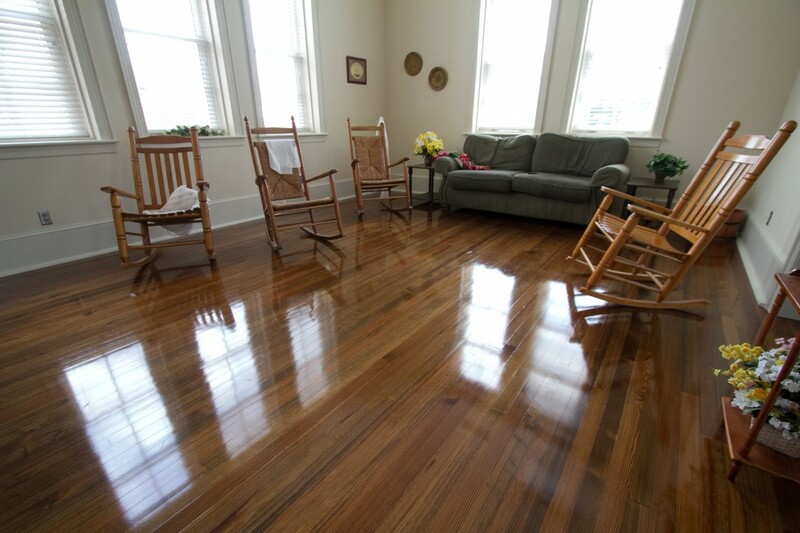 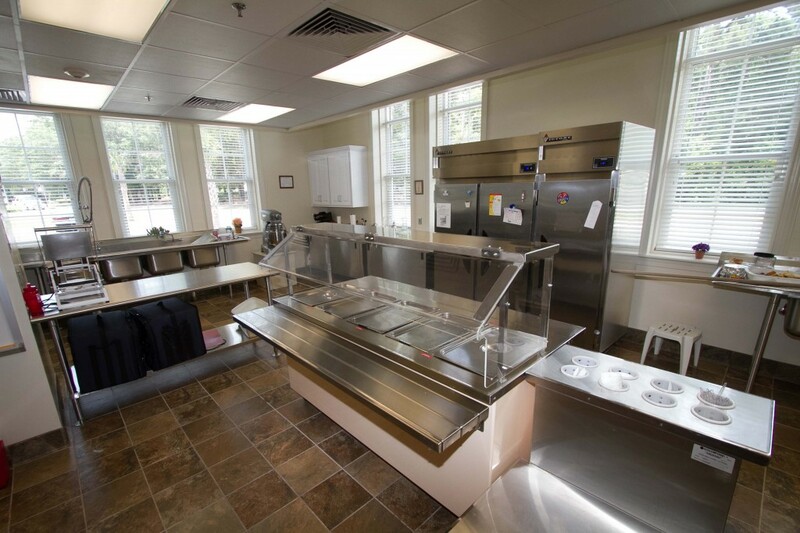 This project was financed through SPLOST funds and a USDA loan. 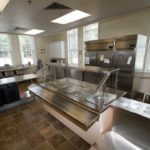 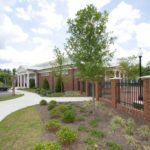 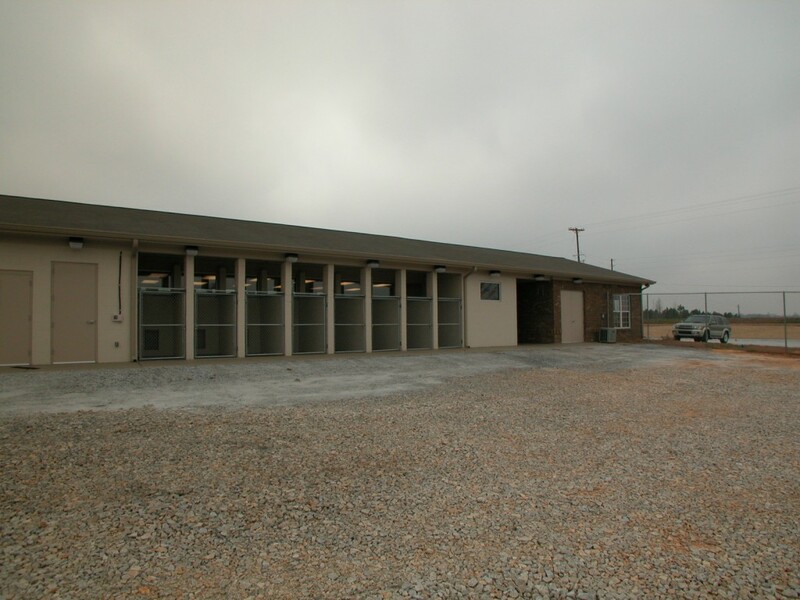 McCall & Associates, Inc. completed the new animal shelter for Meriwether County. 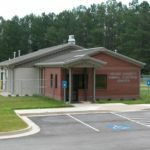 Guidelines of the Georgia Department of Agriculture and the Humane Society of the United States were strictly adhere to in order to provide a safe, sanitary and pleasant environment for all the animals as well as employees. 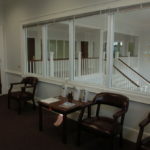 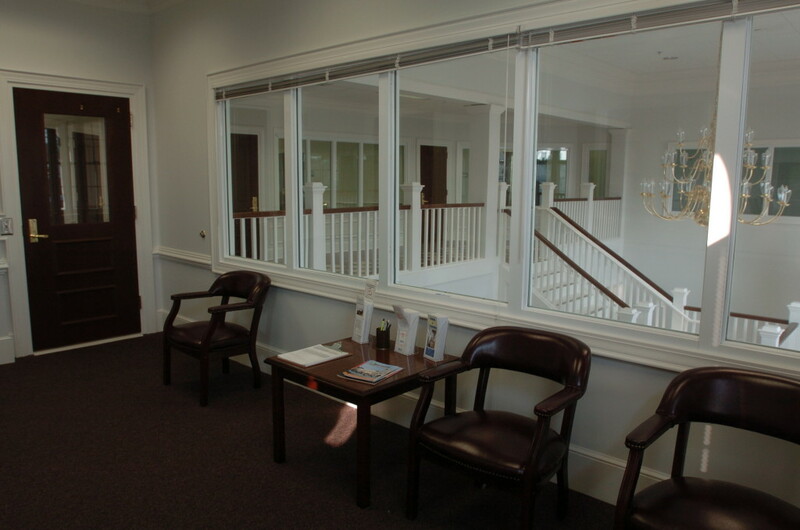 The 4,278 sf building includes a front office and administration area with a public lobby and restrooms. 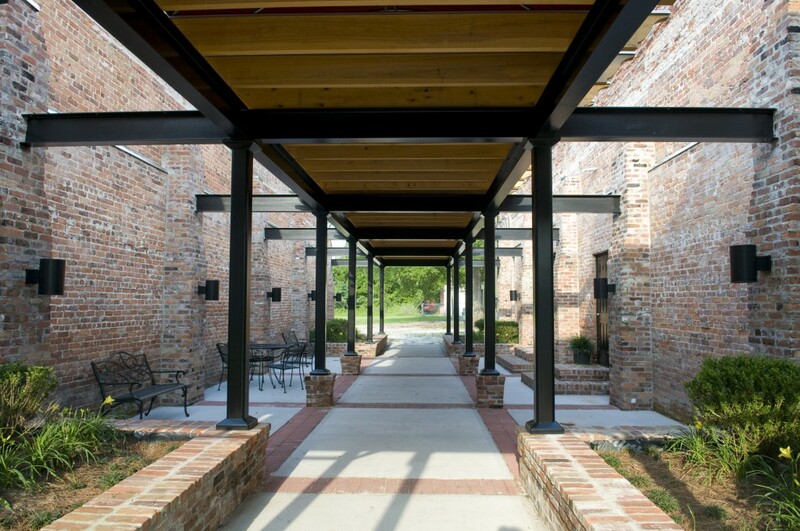 The exterior covered breezeway separates the animal portion of the building. 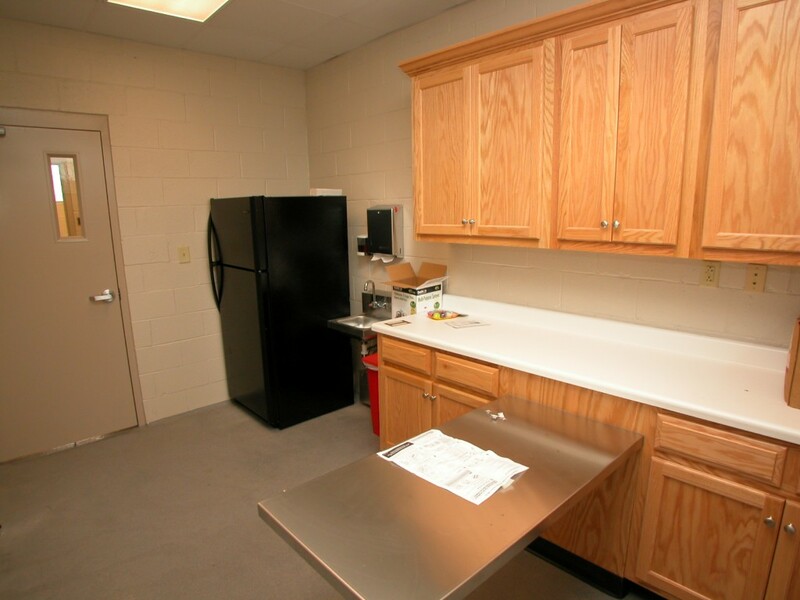 This portion includes 15 cages planned for cats, 6 cages for dogs, and 2 cages for mothers and their puppies. 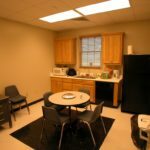 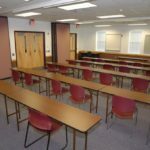 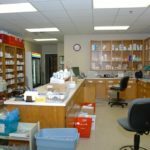 There are also separate rooms for exams, storage, supplies, and euthanasia. 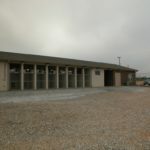 The animal shelter also includes 16 indoor/outdoor kennel runs, which may be subdivided to provide 32 kennels, and 4 interconnected isolation kennels. 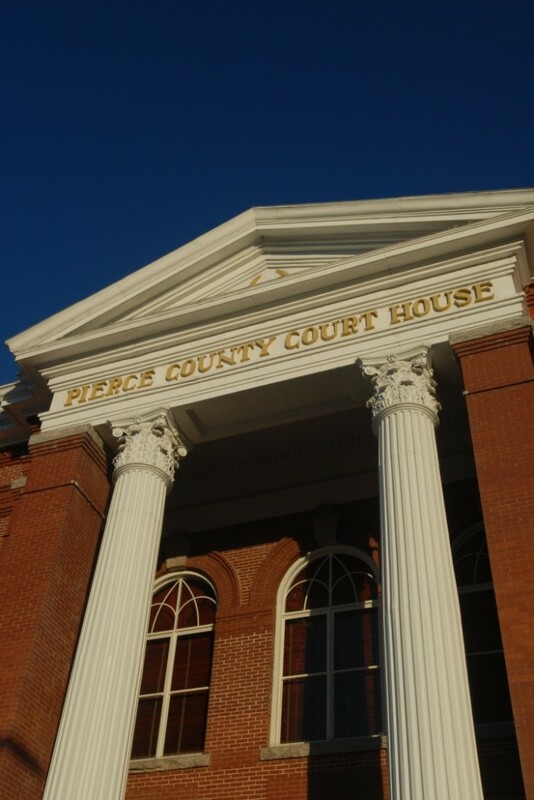 McCall & Associates, Inc. served the Pierce County Board of Commissioners on the project to rehabilitate the county’s historic courthouse. 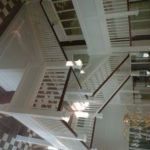 The demolition and removal of a 1970s remodeling project exposed the building’s original balcony, fireplaces in almost every office with original mantles and woodwork about 4 feet high around most of the walls in the building. 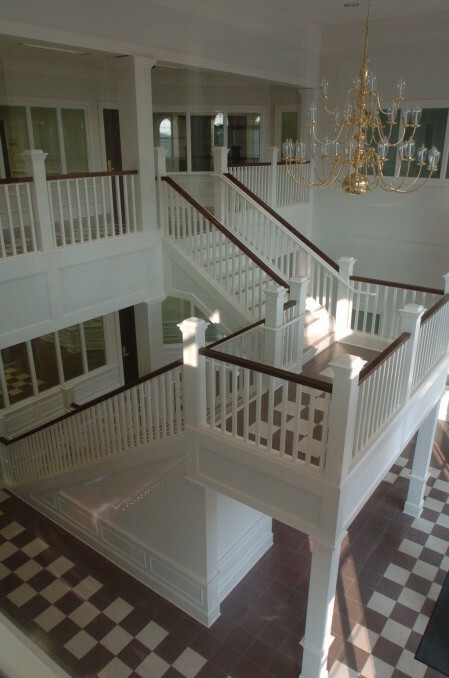 Special efforts were made to maintain the historic nature of the existing building by salvaging and reusing all materials that were practical to be used. 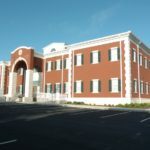 In addition to the the historic preservation work, the building was upgraded to make it a functional space for county employees. 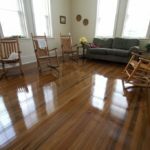 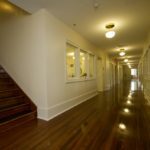 Upgrades include all new voice and data systems, a new fire sprinkler system, new elevator for accessible use, and a computerized control system for the heating and air-conditioning system. 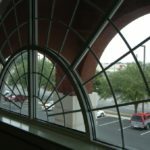 All of the systems that were added to the building are concealed within the structure such that the historic nature of the project and the sensitivity to the project from a historic perspective was maintained. 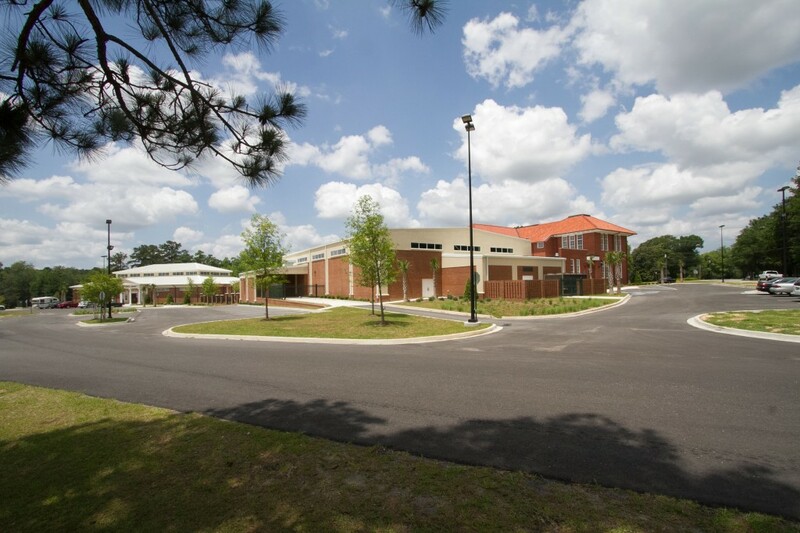 McCall served as the design architect, project manager, and construction coordinator for the county for this project. 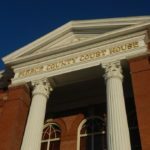 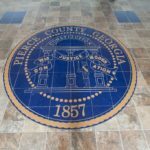 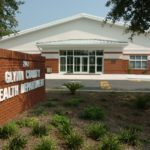 Pierce County utilized the services of a construction team from the Georgia Department of Corrections (GDOC), in order to realize the cost savings which made the project possible. 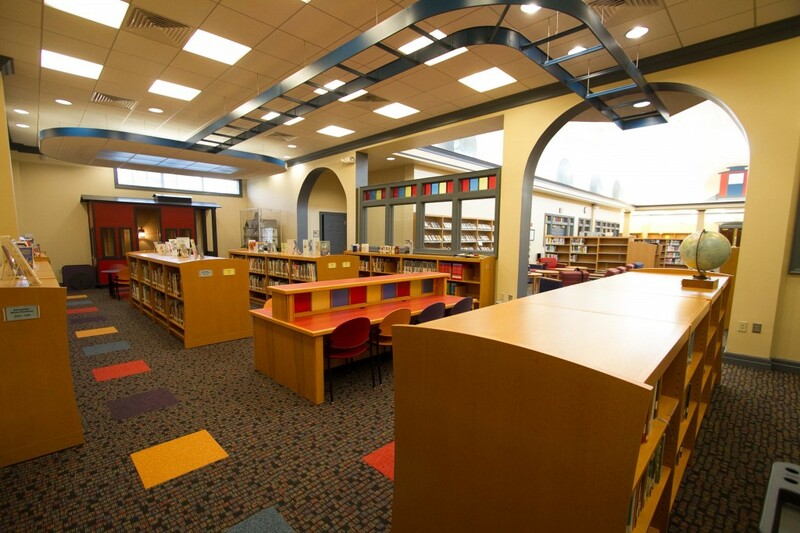 McCall & Associates, Inc. recently completed the new Pierce County Library, providing design and construction management services for the Pierce County Board of Commissioners for this three-building project. 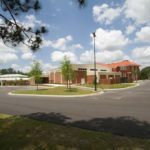 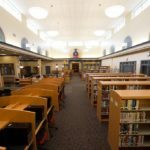 The complete project included the new library, the rehabilitation the historic NFC Building, and the renovation/expansion of the multi-purpose center and gymnasium. 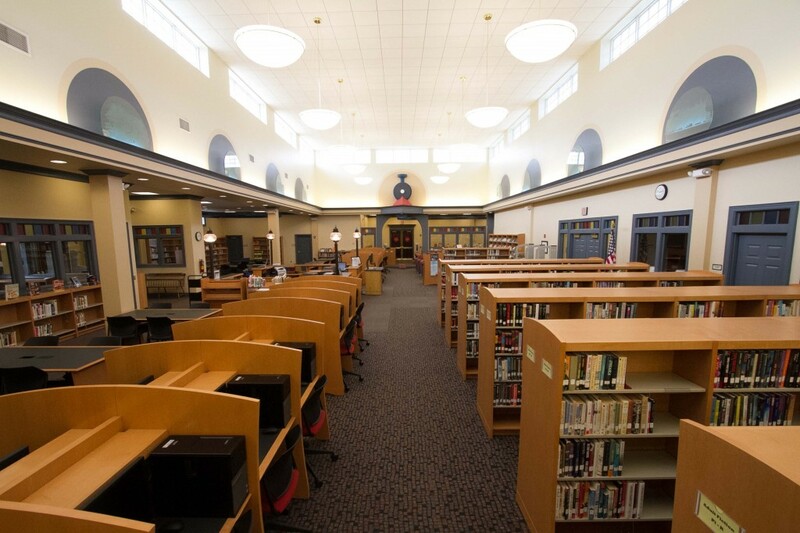 The new library is approximately 11,000 square feet. 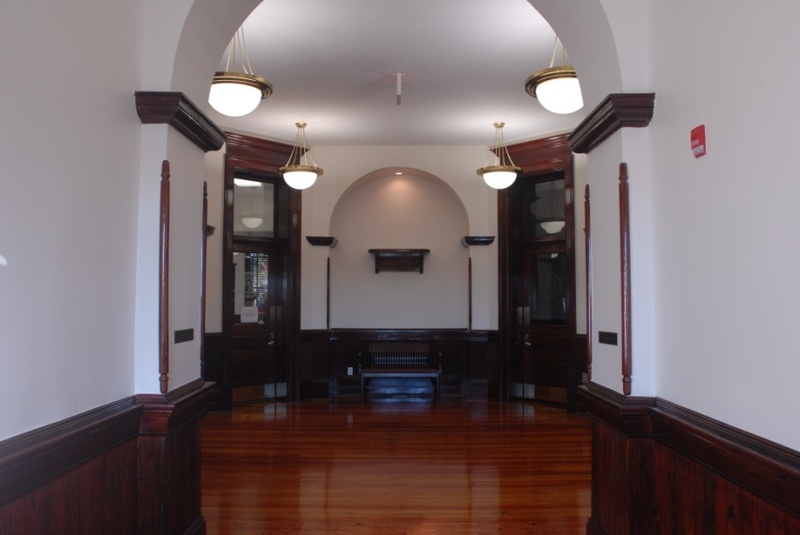 The interior design features a train motif, in keeping with Pierce County’s past history as a noted depot. 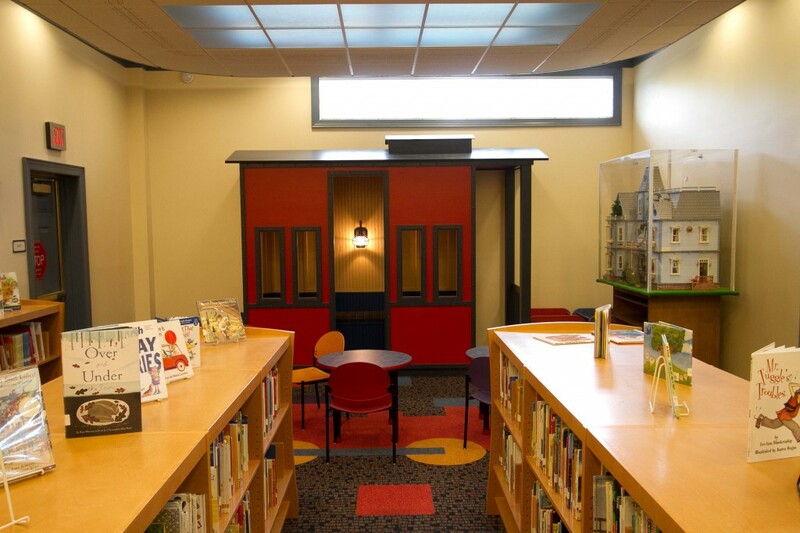 As part of the train theme, the children’s area has a built-in reading nook in the shape of a train car, along with other interior touches reminiscent of locomotives. 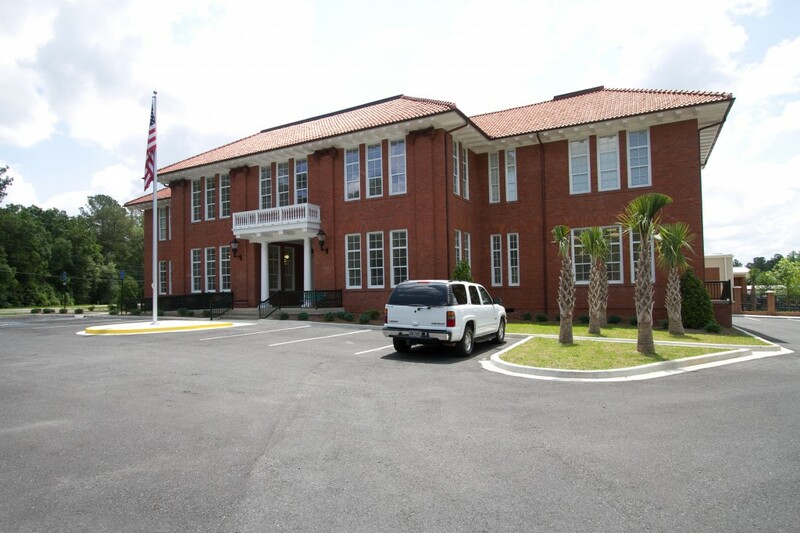 McCall Architecture is managing the rehabilitation of the Pierce County NFC Building; this historic structure was first known as the Presbyterian Institute and then the original Blackshear High School. 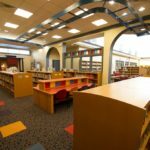 Our firm is serving as Managing Architect – not only providing design services but also project management and construction coordination for the project – which encompasses a total of three individual projects. 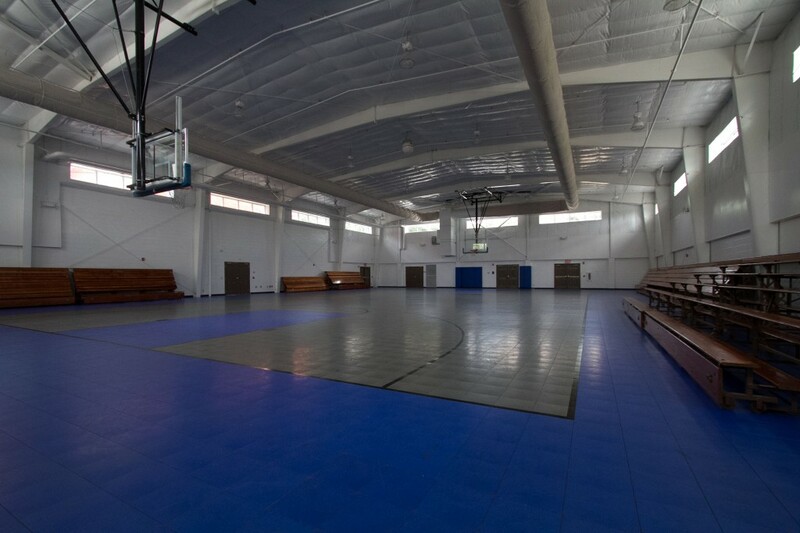 It also includes the renovation of a gymnasium and the construction of a new public library. 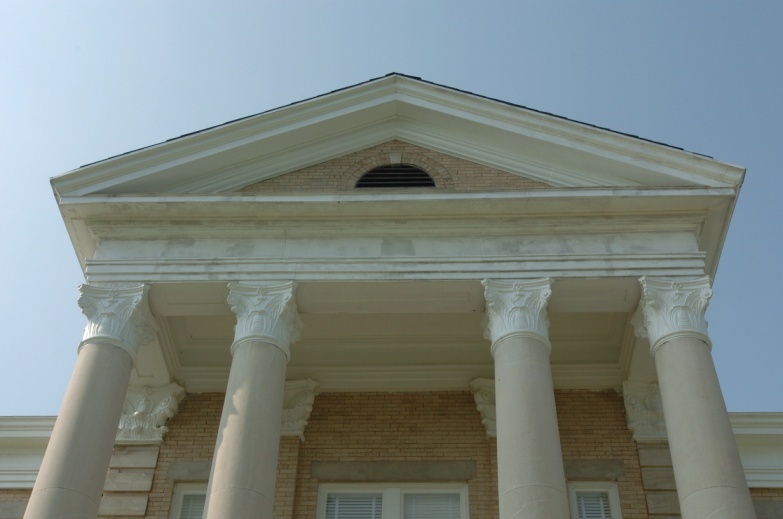 Our team has meticulous managed this project to salvage and save architectural details of the building such as the Ludowici roof tiles, the balustrade over the porch, and the terracotta column capitals. 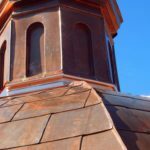 The roof tiles, in particular, were painstakingly removed from the building, carefully stacked and stored on site, and reapplied to the roof. 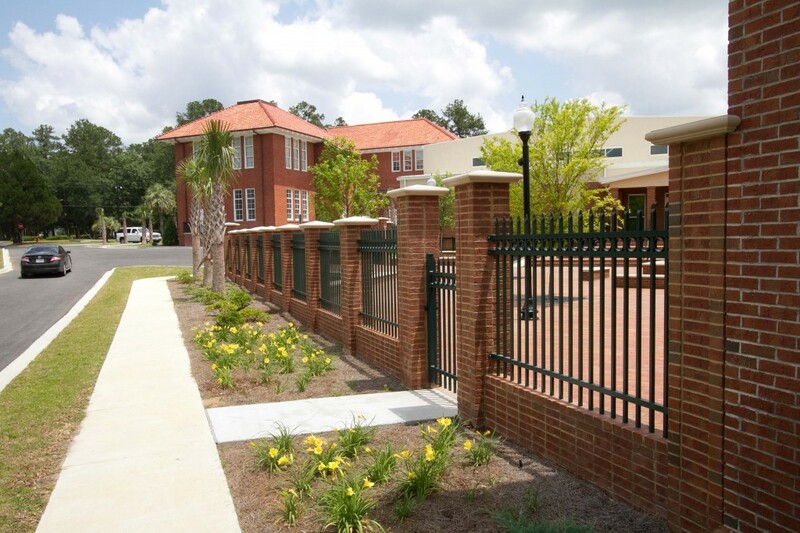 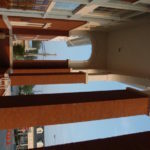 The three structures together comprise a multipurpose community area and are connected by an exterior terrace surrounded by wrought iron fences. 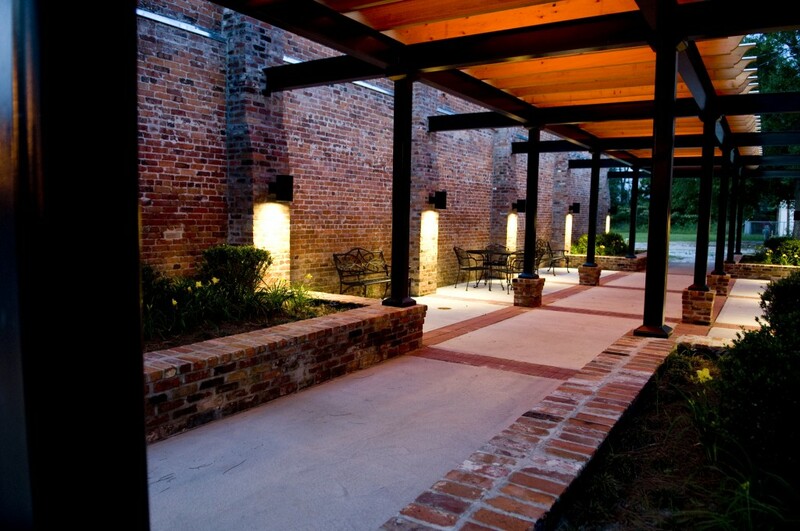 The terrace provides a casual setting and a fountain for the public to enjoy an outside lunch or relaxation. 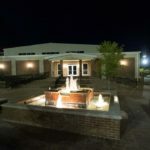 The campus will house not only the library but also the Senior Center, Concerted Services, Recreation Department, Human Resources, Food Pantry, Quilting, and other county functions. 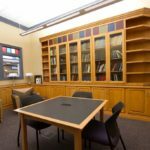 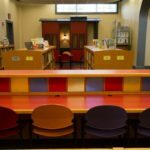 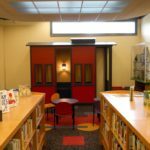 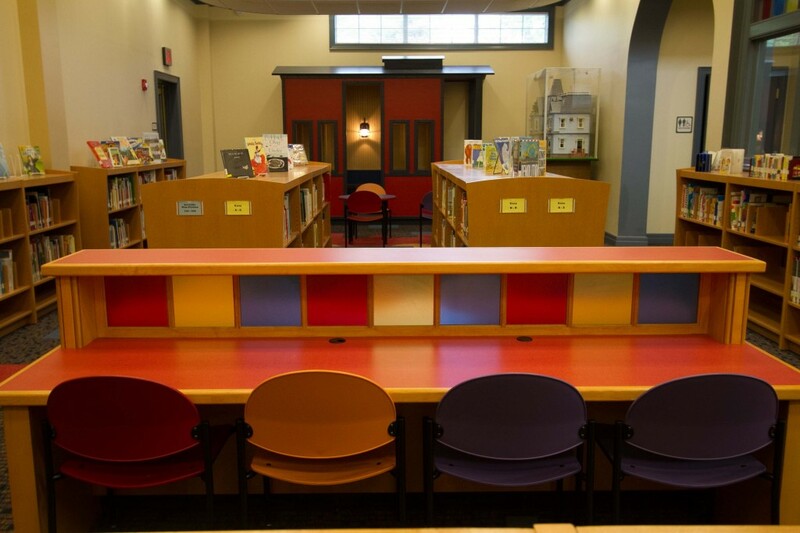 This project was a joint financial effort between Pierce County, the United States Department of Agriculture, and the State Library Board. 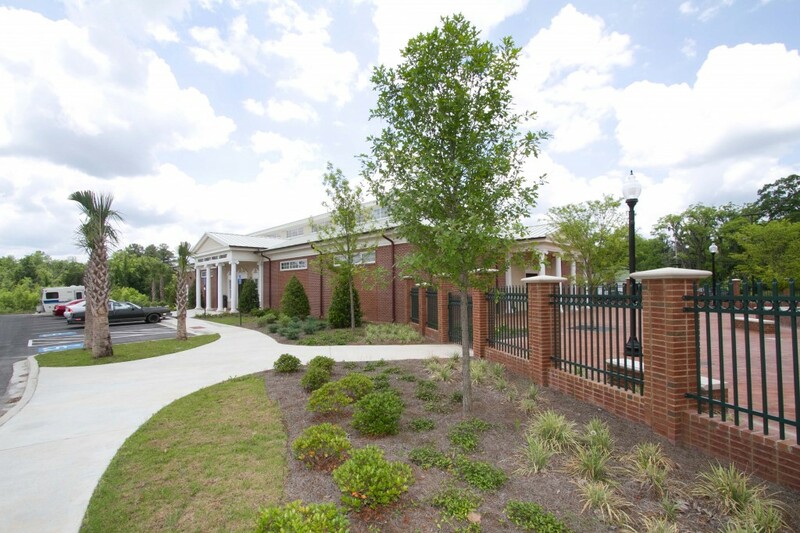 McCall Architecture provided design services for this new fire station and EMS headquarters for Thomas County. 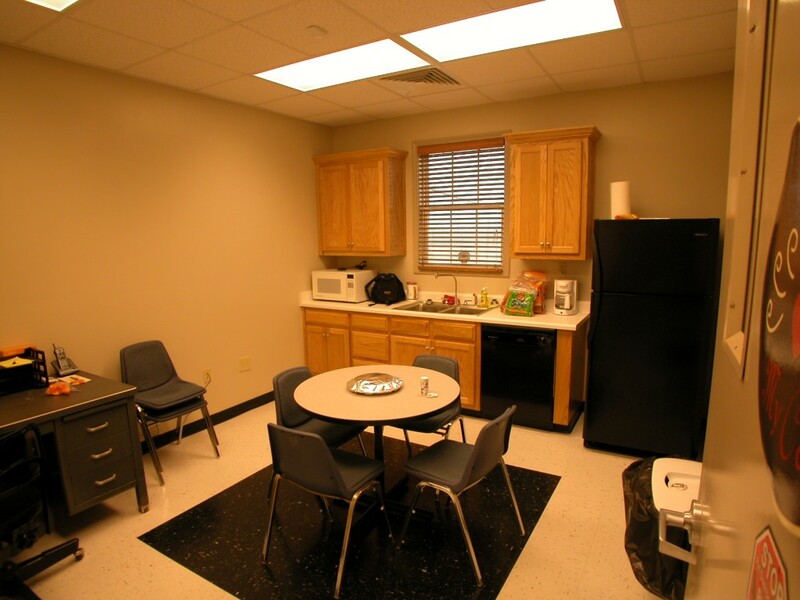 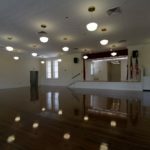 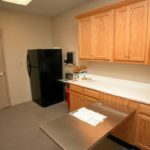 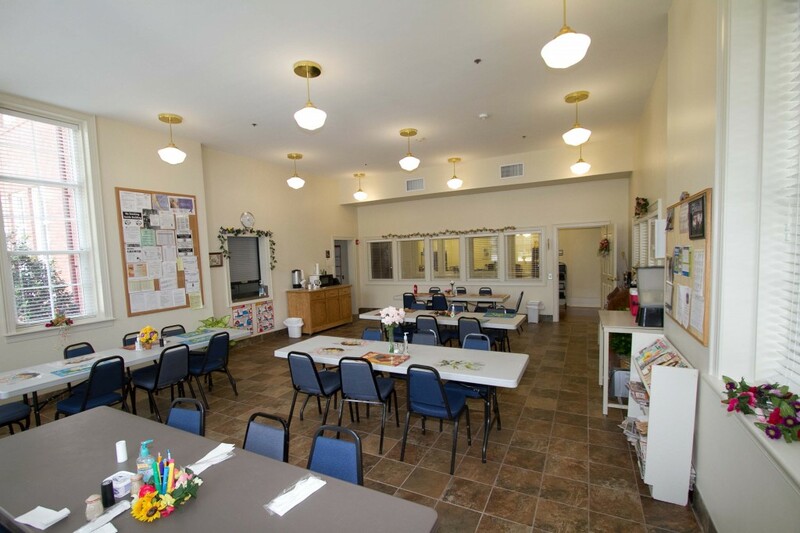 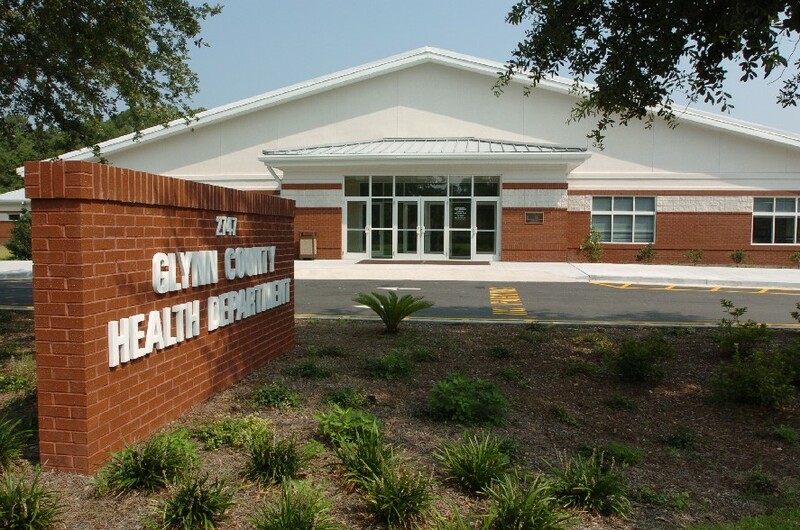 The facility features four bays (incompassing eight parking areas), four bedrooms for on-duty employees, a communal kitchen and lounge area, and a large multipurpose room. 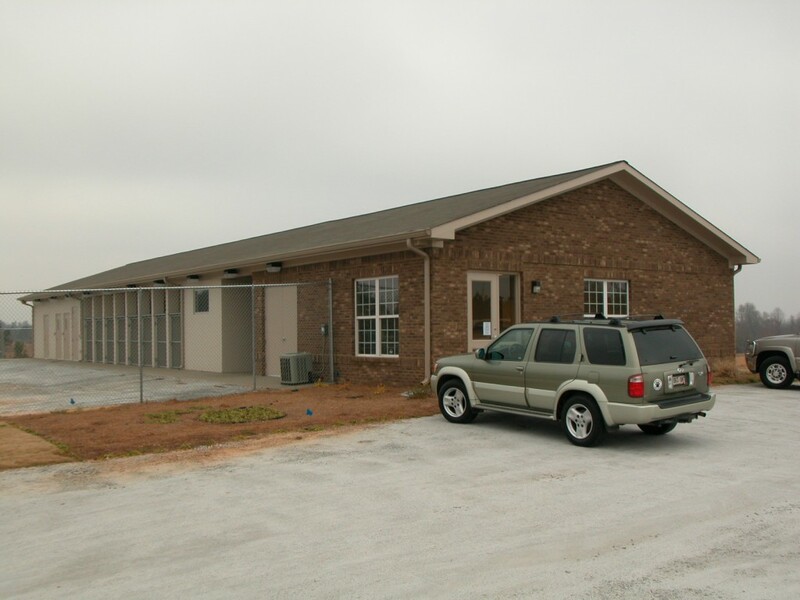 This 1,680 square foot space serves as the county’s Secondary Emergency Operations Center. 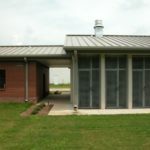 The building has a fully automatic back-up electrical system as well as exterior storage areas for oxygen and other combustibles.